U.S. equity indices finally started moving lower last week from intermediate overbought levels. 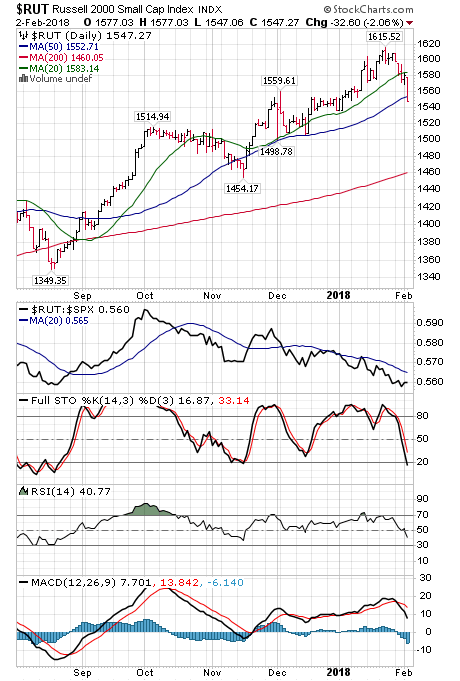 Short term technical indicators (momentum, 20 day moving average) turned sharply lower. 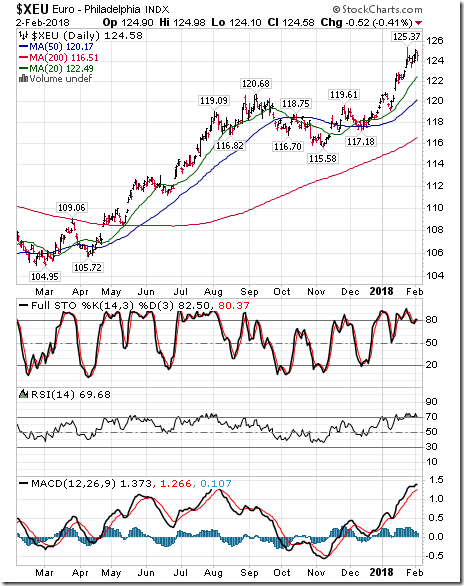 Intermediate technical indicators remain overbought despite their decline last week, but have yet to show signs of bottoming. 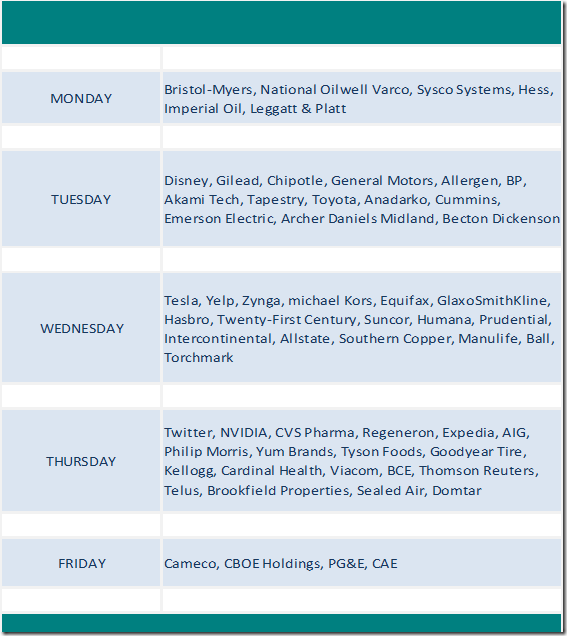 Lots of “sell on news” last week despite reports of stronger than consensus fourth quarter results by most S&P 500 companies! Look for more of the same early this week. 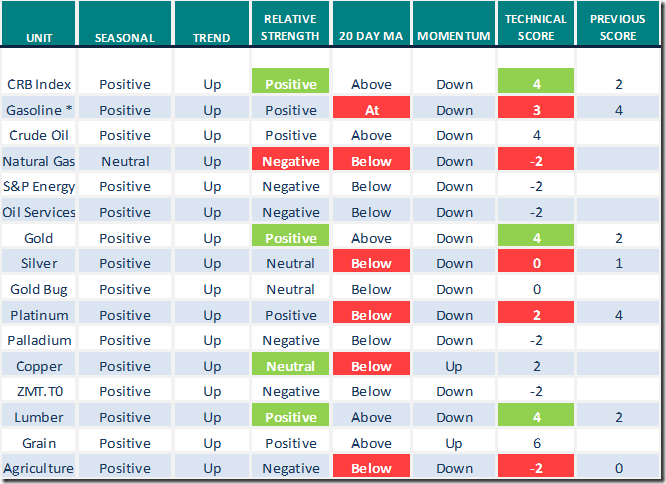 Even seasonally positive sectors such as commodities were hit last week (e.g. precious and base metal prices, crude oil, grains, lumber). 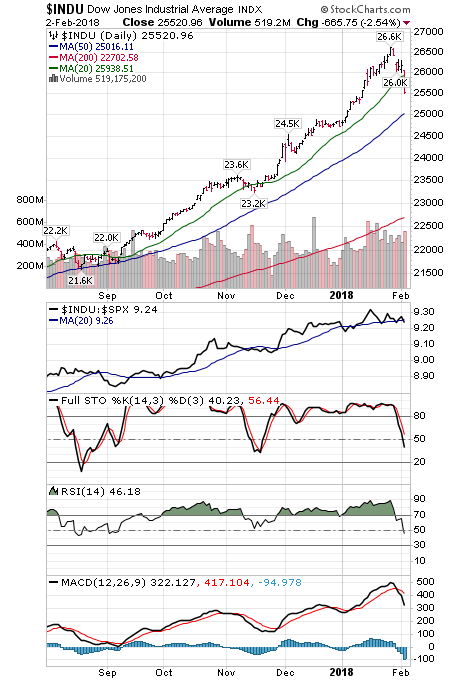 However, they continued to outperform the S&P 500 Index, a technical sign that they likely will are top purchase candidates when technical signs of an equity market bottom become apparent. 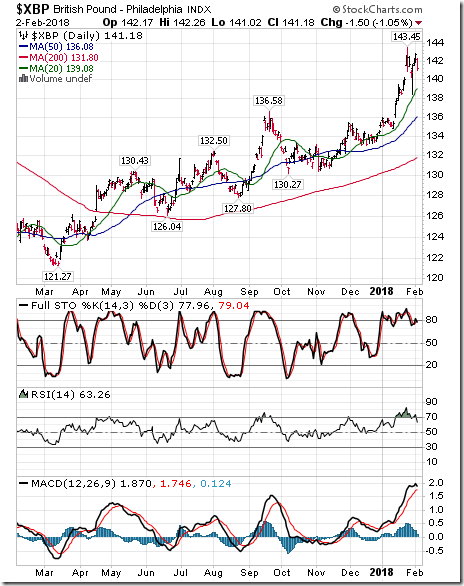 Weakness in U.S. equity markets last week were related to completion of a Head & Shoulders/Double Top pattern by the long term Treasury ETF (TLT). 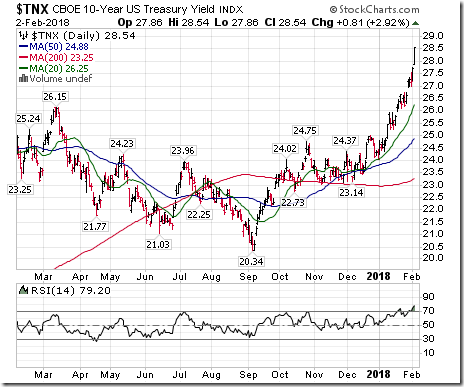 Additional weakness in Treasury prices following an important technical breakdown is likely this week. 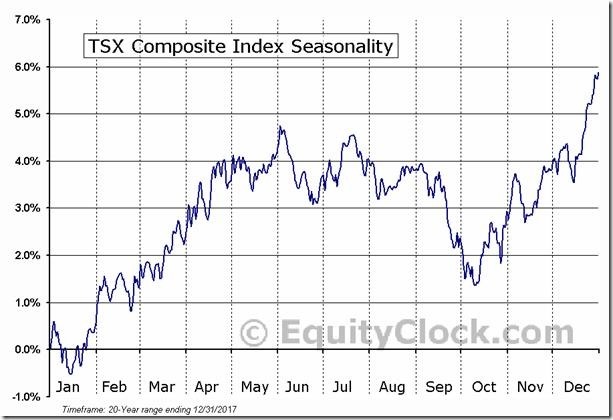 The TSX Composite Index reached a short term peak five weeks ago. 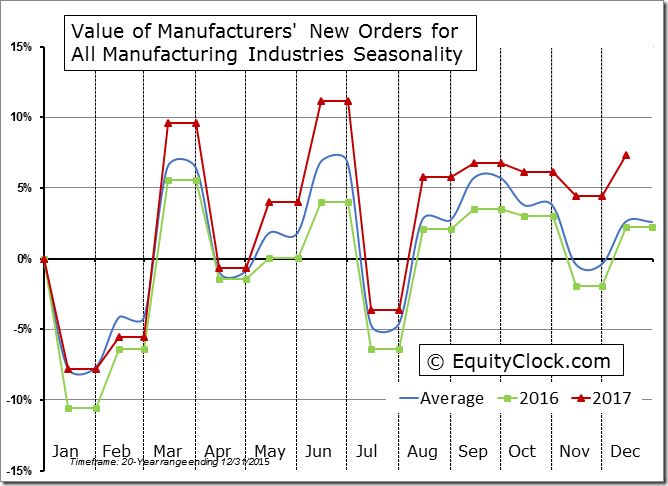 The Index currently is lower than levels reached in late September and February last year (i.e. On a year-over-year basis, the Index is slightly lower). Concerns about NAFTA negotiations, changing real estate purchase laws and rising interest rates are issues. 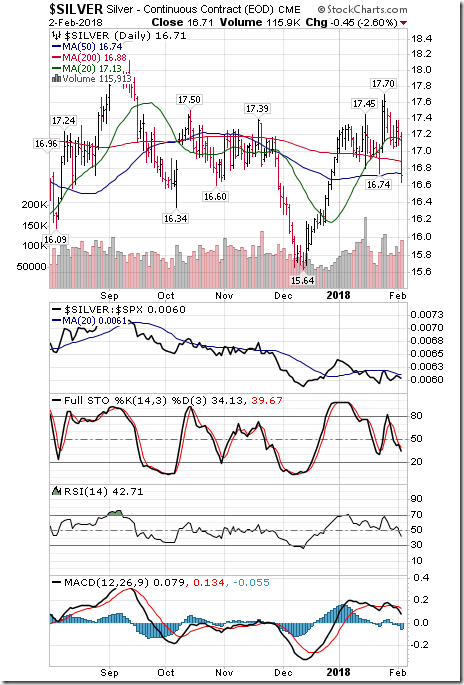 The Index already has reached an intermediate oversold level, but has yet to show signs of bottoming. Canadian December Merchandise Trade Deficit to be released at 8:30 AM EST on Tuesday is expected to ease to $2.3 billion versus $2.5 billion in November. Canadian January Employment to be released at 8:30 AM EST on Friday is expected to drop 2,000 versus a gain of 64,800 in December. January Unemployment Rate is expected to remain unchanged from December at 5.8%. 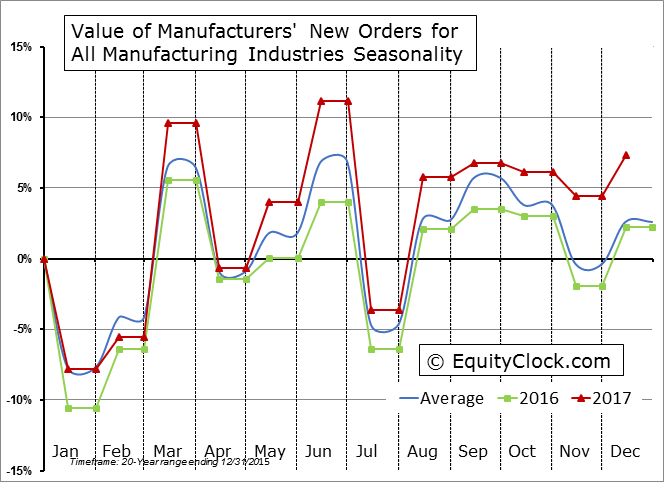 U.S. economic news this week is relatively quiet. Canadian economic news this week focuses on the January Employment report to be released on Friday. 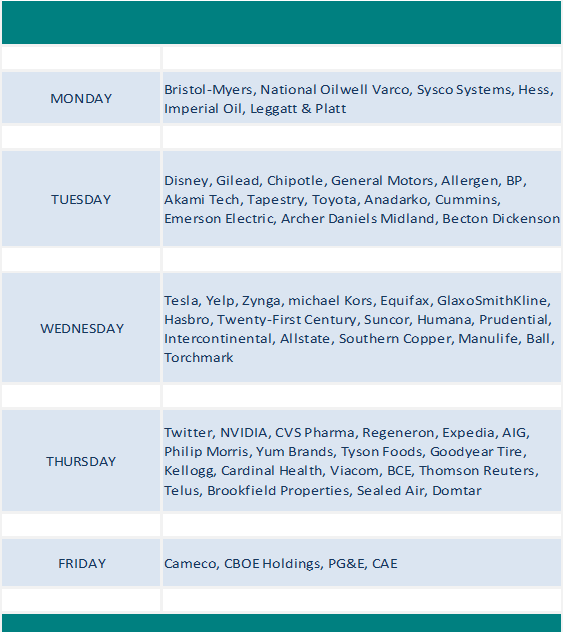 Fourth quarter earnings reports will continue to flow quickly this week. Reports by Canadian companies will start to trickle in. 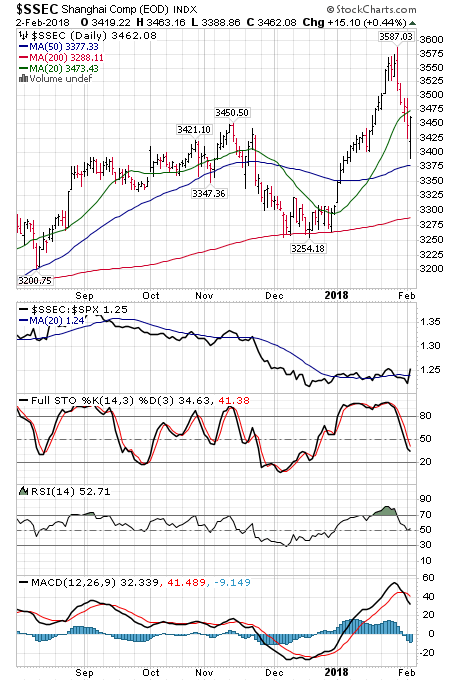 Short term technical indicators for U.S. and Canadian equity markets and most sectors (short term momentum, above/below 20 day moving average) are trending down, but have yet to show signs of bottoming. 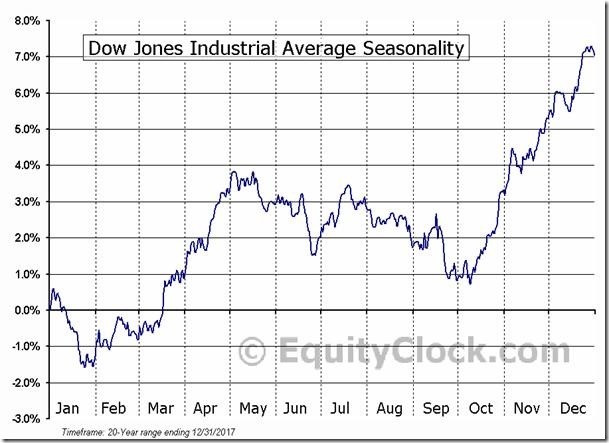 Seasonal influences on a wide variety of U.S. equity indices and economic sensitive sectors are Positive at this time of year. See charts below. Fourth quarter reports released by S&P 500 companies to date have been encouraging. 50% of S&P 500 stocks have reported to date. 75% reported higher than consensus earnings and 80% reported higher than consensus revenues. Another 91 S&P 500 companies and 1 Dow Jones Industrial company are scheduled to release quarterly results this week. The outlook for S&P 500 earnings and sales remains positive: According to FactSet, fourth quarter adjusted earnings (excluding one-time write downs related to the tax bill) are expected to increase 13.4% (Up from 12.0% last week) on a 7.5% increase in sales (up from 7.0% last week). Estimates beyond the fourth quarter of 2017 were revised higher again mainly due to changes in U.S. corporate tax laws. First quarter 2018 earnings are expected to increase 16.9% (up from 16.0% last week) on a 7.1% increase in sales. Second quarter 2018 earnings are expected to increase 16.0% (up from 15.0%) on a 7.2% increase in revenues (up from 7.1%). Third quarter earnings are expected to increase 18.3% (up from 17.3%) on a 7.5% increase in revenues (up from 5.9%). Fourth quarter 2018 earnings are expected to increase 14.2% on a 4.8% increase in revenues (up from 4.6%). For all of 2018, earnings are expected to increase 16.8% (up from 16.3%) on a 6.4% increase in sales (up from 6.0%). Earnings and revenue prospects beyond the fourth quarter report season are exceptional for U.S. based companies with international exposure. Consensus for S&P 500 earnings on a year-over-year are expected to exceed 16% in 2018. 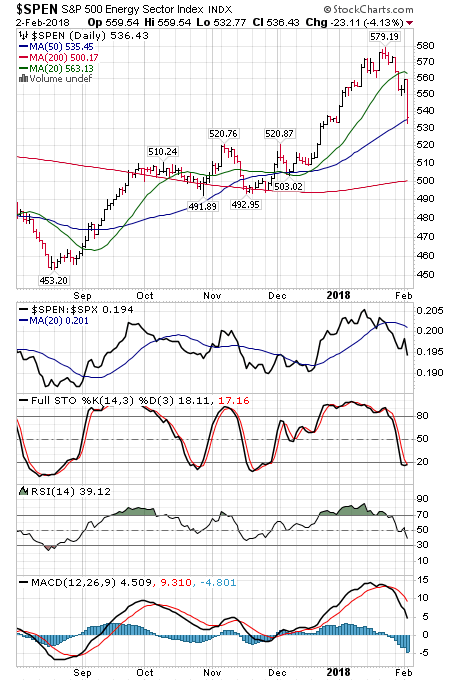 Earnings will benefit significantly from weakness in the U.S. Dollar on a year-over-year basis when revenues and earnings from international operations are translated into U.S. Dollars. For example, a U.S. based company with 50% of its earnings and revenues coming from international operations will see earnings and revenues increase by 7% from foreign currency translation alone following a 14% fall in the U.S. Dollar Index from its high at 103.82 in January 2017. 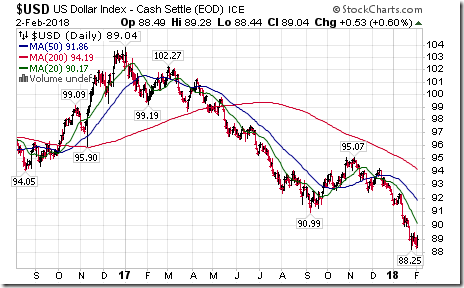 The U.S. Dollar Index averaged 100 in the fourth quarter of 2016 and 101 in the first quarter of 2017. The S&P 500 Index plunged 110.74 points (3.85%) last week. Intermediate trend remains up. 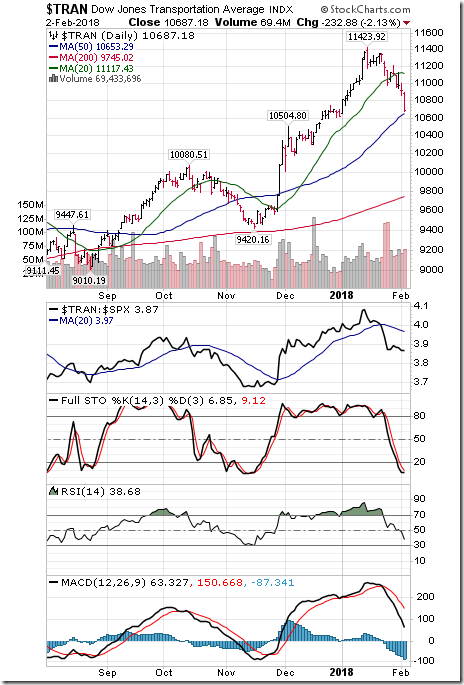 The Index dropped below its 20 day moving average on Friday. Short term momentum indicators are trending down. Percent of S&P 500 stocks trading above their 50 day moving average (Also known as the S&P 500 Momentum Barometer) plunged last week to 60.40 from 84.00. Percent remains intermediate overbought and is trending down. Percent of S&P 500 stocks trading above their 200 day moving average dropped last week to 76.00 from 82.80. Percent remains intermediate overbought and is trending down. 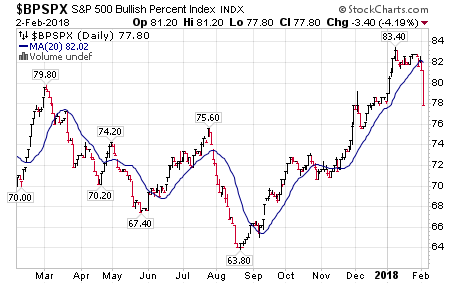 Bullish Percent Index for S&P 500 stocks plunged last week to 77.80 from 82.90 and dropped below its 20 day moving average. 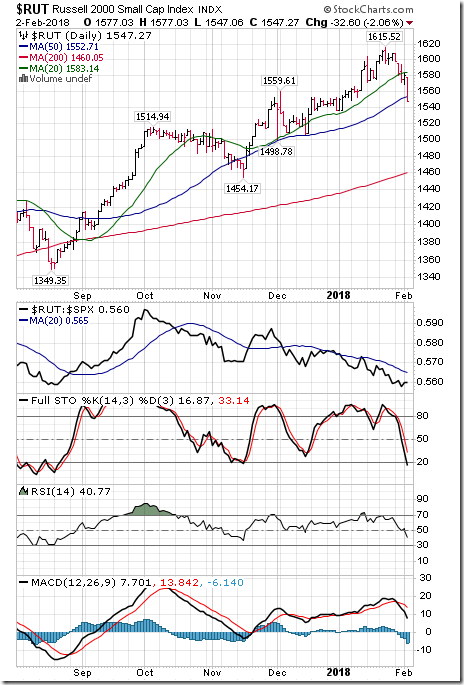 The Index remains intermediate overbought and trending down. 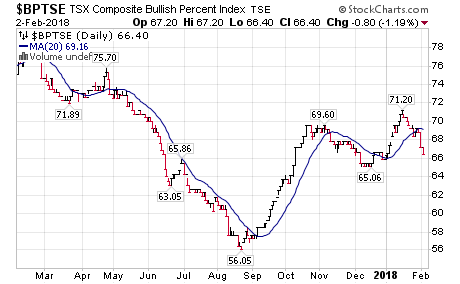 Bullish Percent Index for TSX stocks dropped last week to 66.40 from 68.90 and remained below its 20 day moving average. 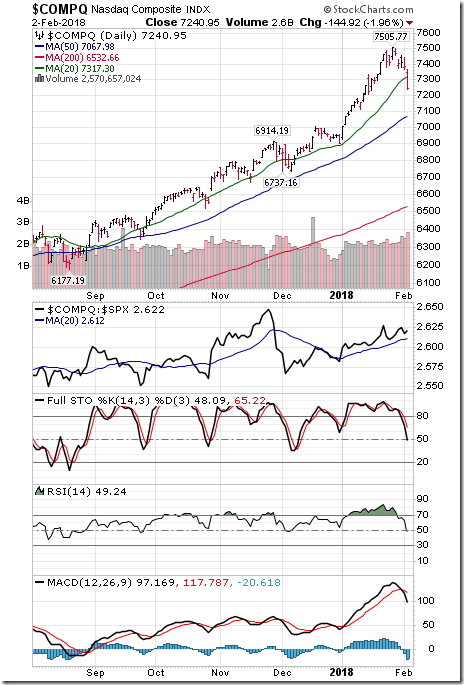 The Index remains intermediate overbought and trending down. 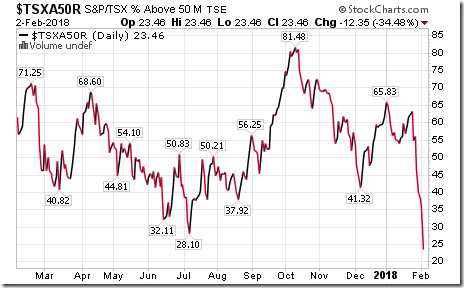 Percent of TSX stocks trading above their 50 day moving average (Also known as the TSX Momentum Barometer) plunged last week to 23.46 from 56.20. Percent has become oversold, but has yet to show signs of bottoming. 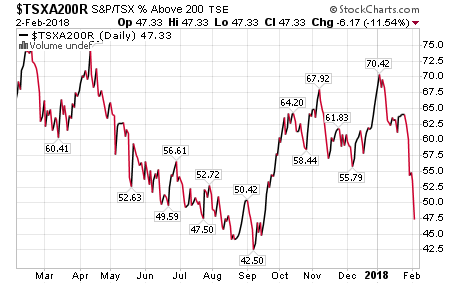 Percent of TSX stocks trading above their 200 day moving average plunged last week to 47.33 from 62.40. Percent has declined to Neutral from Overbought and is trending down. Dow Jones Industrial Average plunged 1,095.75 points (4.12%) last week. Intermediate trend remains up. 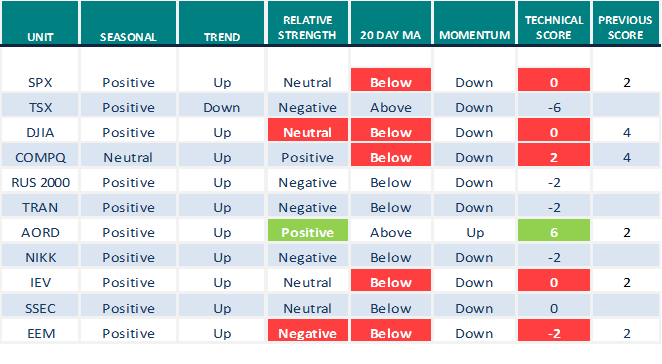 Strength relative to the S&P 500 Index changed on Friday to Neutral from Positive. The Average dropped below its 20 day moving average on Friday. Short term momentum indicators are trending down. Technical score dropped last week to 2 from 6. 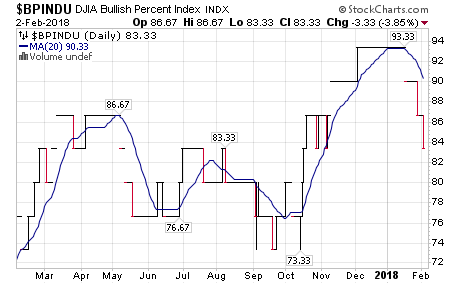 Bullish Percent Index for Dow Jones Industrial stocks dropped last week to 83.33 from 90.00 and remained below its 20 day moving average. 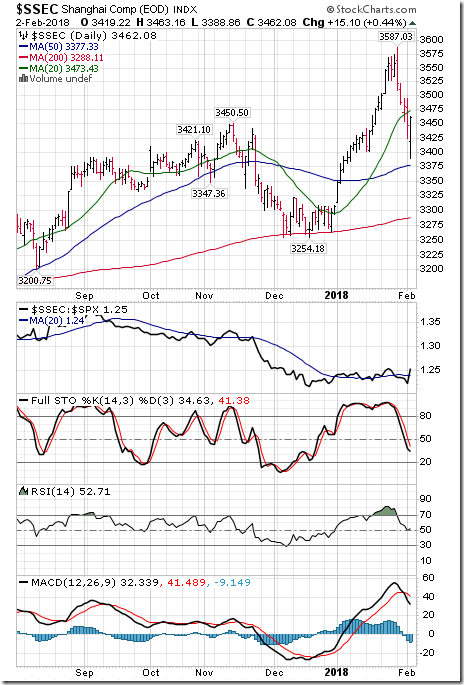 The Index remains intermediate overbought and trending down. 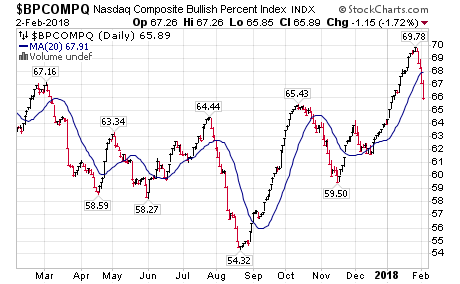 Bullish Percent Index for NASDAQ Composite stocks dropped last week to 65.89 from 69.78 and dropped below its 20 day moving average. 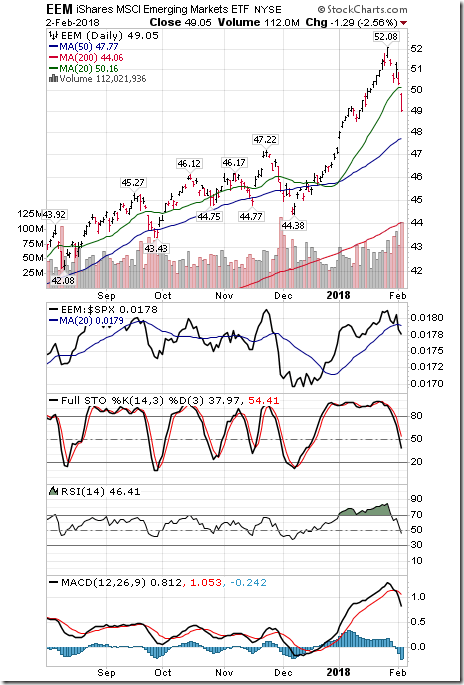 The Index remains intermediate overbought and has turned down. 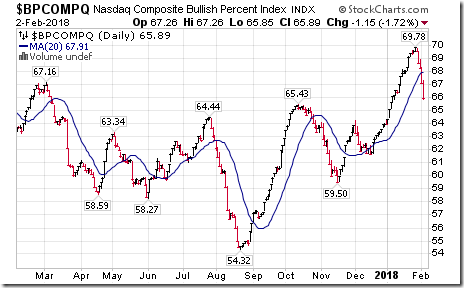 NASDAQ Composite Index plunged 264.82 points (3.53%) last week. Intermediate trend remains up. Strength relative to the S&P 500 Index remains Positive. 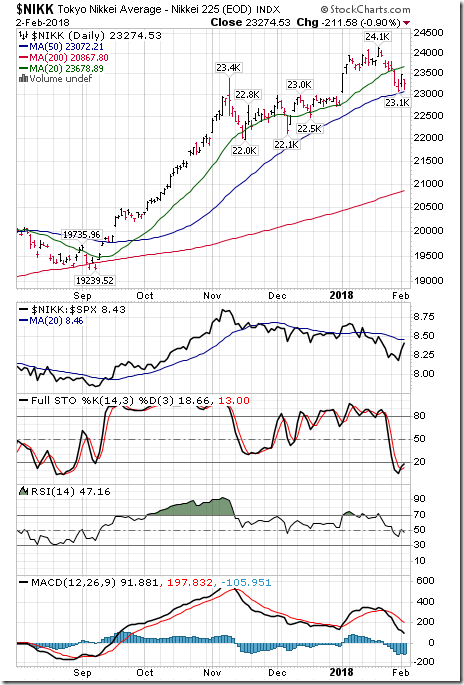 The Index dropped below its 20 day moving average on Friday. 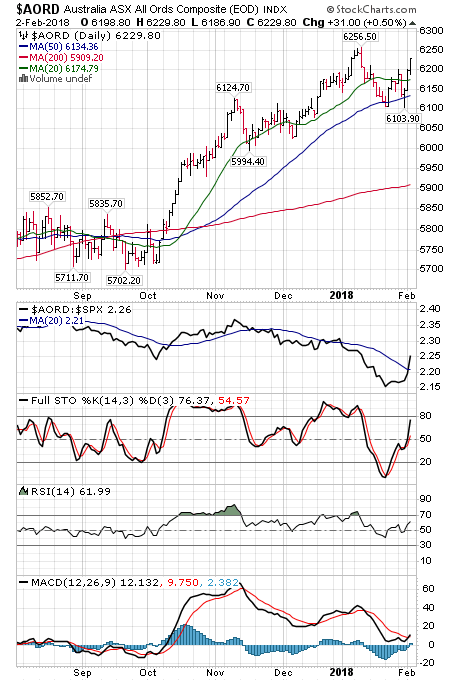 Short term momentum indicators dropped last week to 2 from 6. 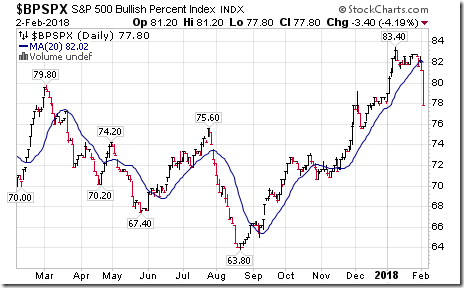 Russell 2000 Index dropped 60.79 points (3.78%) last week. Intermediate trend remains up. 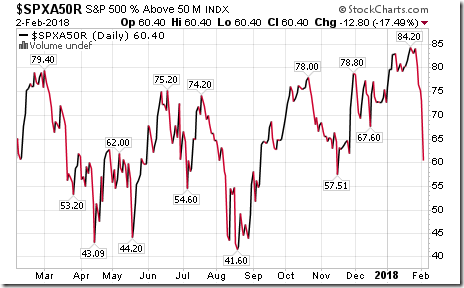 Strength relative to the S&P 500 Index remains Negative. 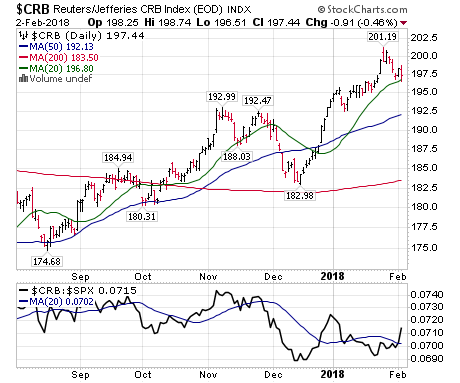 The Index dropped below its 20 day moving average. Short term momentum indicators are trending down. Technical score dropped last week to -2 from 0. Australia All Ordinaries Composite Index gained 65.10 points (1.06%) last week. Intermediate trend remains up. Strength relative to the S&P 500 Index changed on Friday to Positive from Negative. 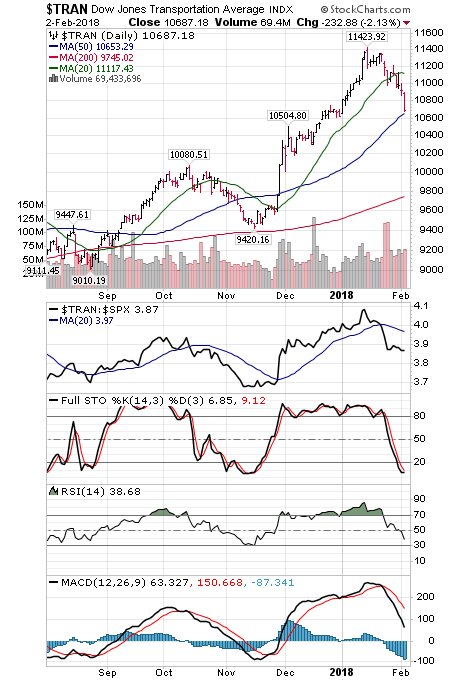 The Index moved above its 20 day moving average. Short term momentum indicators are trending up. Technical score increased last week to 6 from 0. Nikkei Average dropped 357.35 points (1.51%) last week. Intermediate trend remains up. 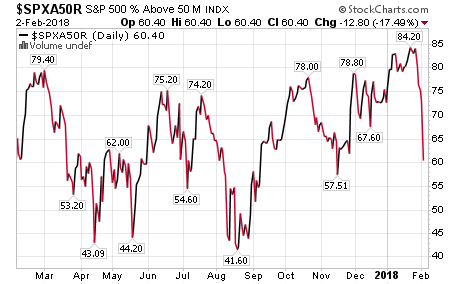 Strength relative to the S&P 500 Index remains Negative. The Average dropped below its 20 day moving average. Short term momentum indicators are trending down. Technical score dropped last week to -2 from 0. Europe iShares dropped $2.00 (3.94%) last week. Intermediate trend remains up. Strength relative to the S&P 500 Index changed to Neutral from Positive. Units dropped below their 20 day moving average on Friday. Short term momentum indicators are trending down. Technical score dropped last week to 0 from 6. Shanghai Composite Index dropped 96.05 points (2.70%) last week. Intermediate trend remains up. Strength relative to the S&P 500 Index changed to Neutral from Positive. 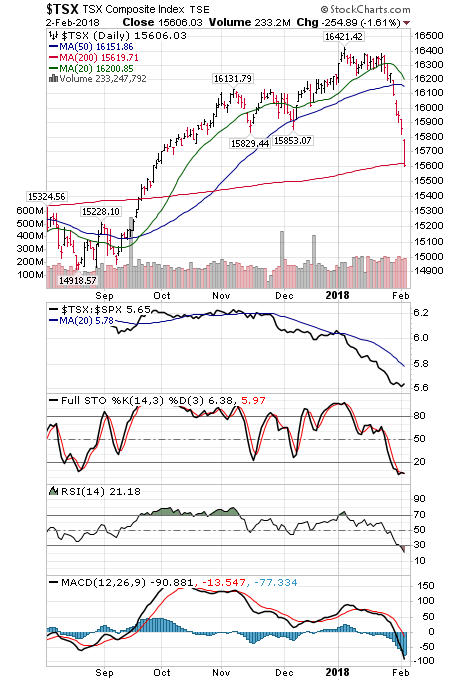 The Index dropped below its 20 day moving average. Short term momentum indicators are trending down. Technical score dropped last week to 0 from 6. 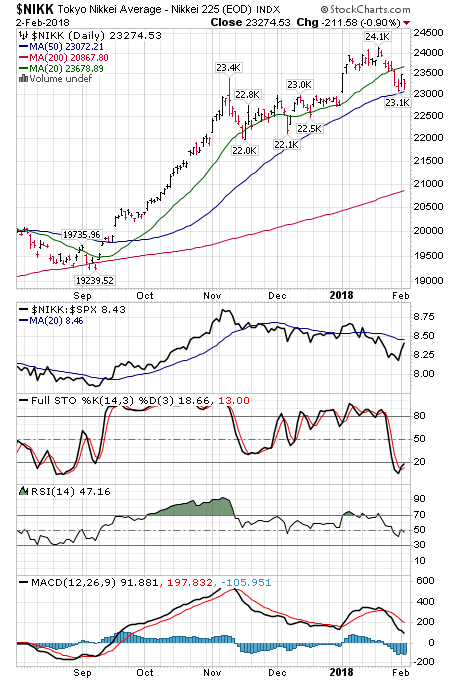 Emerging Markets iShares dropped 3.03 points (5.82%) last week. Intermediate trend remains up. Strength relative to the S&P 500 Index changed last week to Negative from Positive. Units dropped below their 20 day moving average on Friday. Short term momentum indicators are trending down. Technical score dropped last week to -2 from 6. 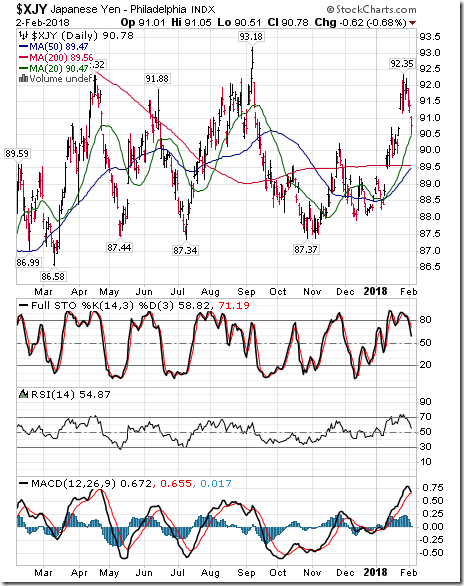 The U.S. Dollar Index added 0.15 (0.17%) last week. 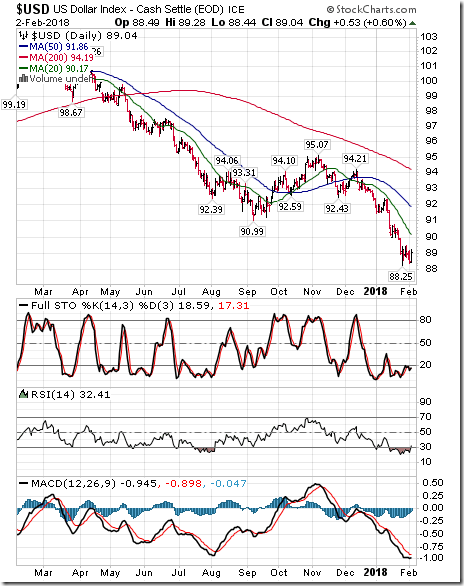 Intermediate trend remains down. The Index remains below its 20 day moving average. Short term momentum indicators are trending down. The Euro gained 0.36 (0.29%) last week. Intermediate trend remains up. 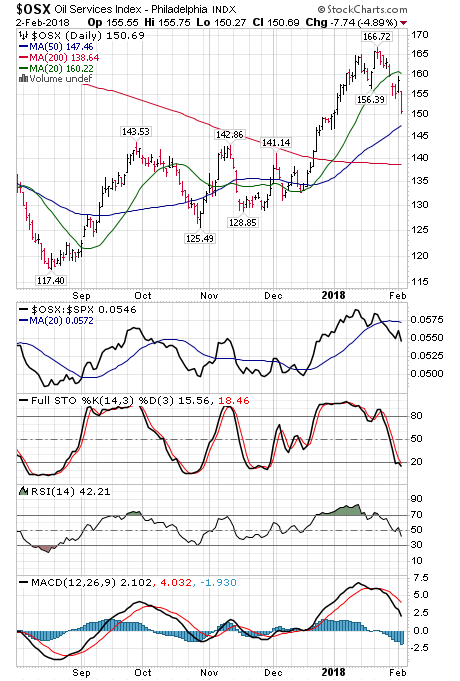 The Euro remained above its 20 day moving average. 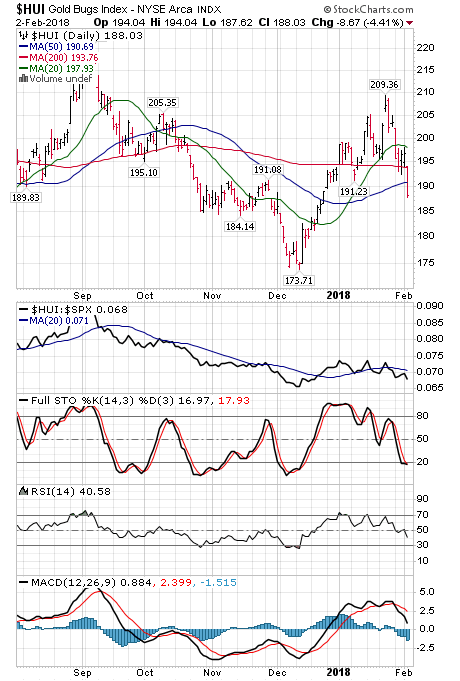 Short term momentum indicators are trending up. Canadian Dollar dropped U.S 0.66 cents (0.81%) last week with more than all of the drop occurring on Friday. Intermediate trend remains neutral. The Canuck Buck remains above its 20 day moving average. 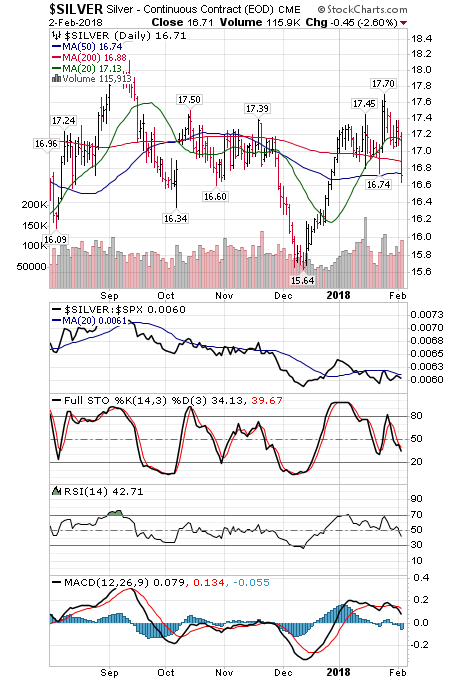 Short term momentum indicators turned down on Friday. Japanese Yen dropped 1.23 (1.34%) last week. Intermediate trend remains up. 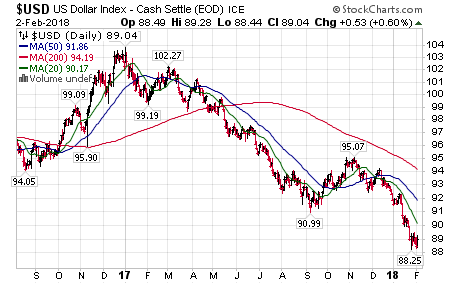 The Yen remained above its 20 day moving average. Short term momentum indicators have turned down. British Pound slipped 0.31 (0.22%) last week. Intermediate trend remains up. The Pound remains above its 20 day moving average. 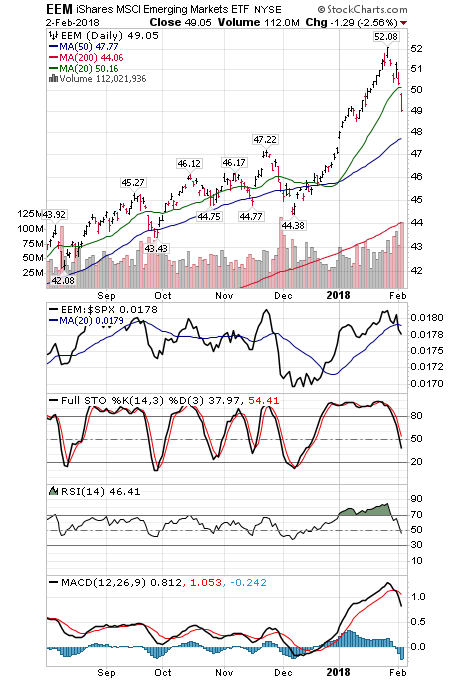 Short term momentum indicators are overbought and showing early signs of rolling over. 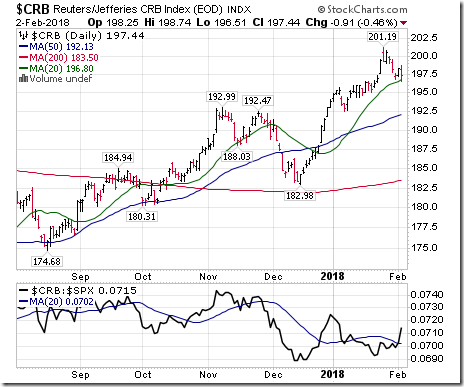 The CRB Index dropped 3.08 points (1.52%) last week. Intermediate trend remains up. Strength relative to the S&P 500 Index changed to Positive from Neutral. 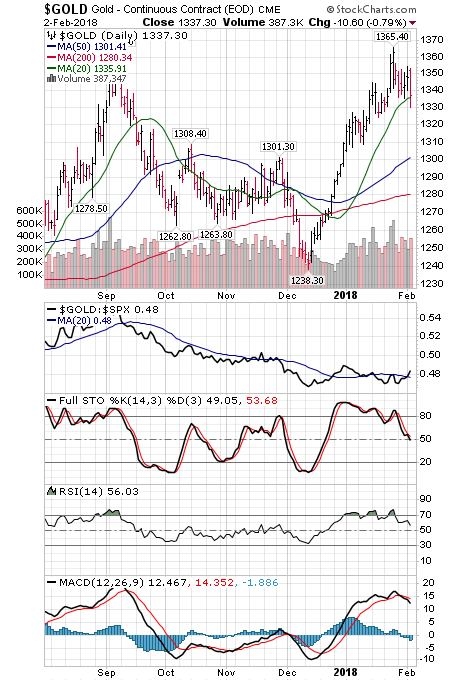 The Index remained above its 20 day moving average. Short term momentum indicators are trending down. Technical score remained last week at 4. 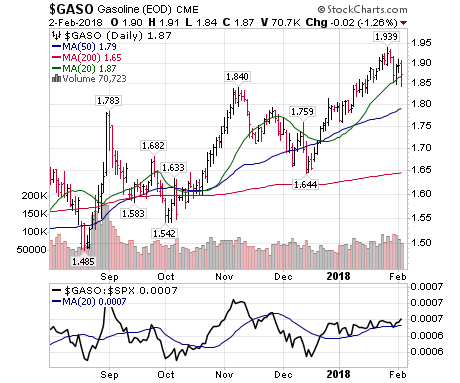 Gasoline dropped $0.06 per gallon (3.11%) last week. Intermediate trend remains up. Strength relative to the S&P 500 Index remains Positive. 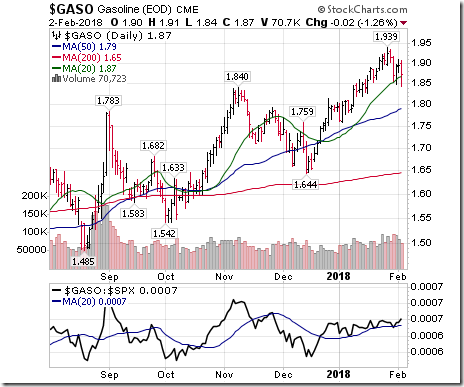 Gas closed at its 20 day moving average on Friday. 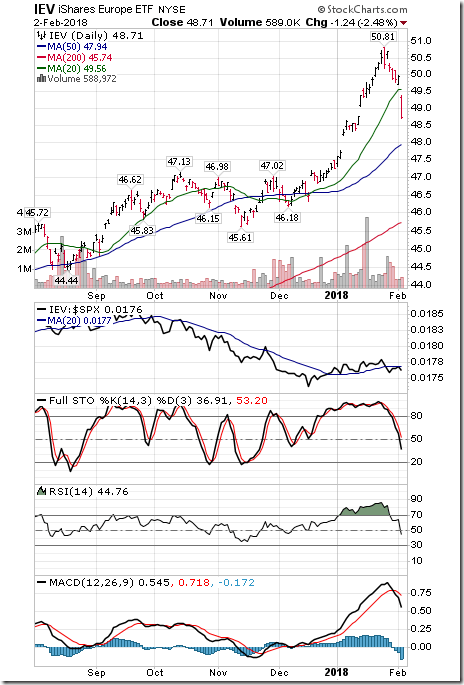 Short term momentum indicators have turned down. Technical score dropped last week to 3 from 6. Crude Oil slipped $0.69 per barrel 1.04% last week. Intermediate trend remains up. Strength relative to the S&P 500 Index remained Positive. 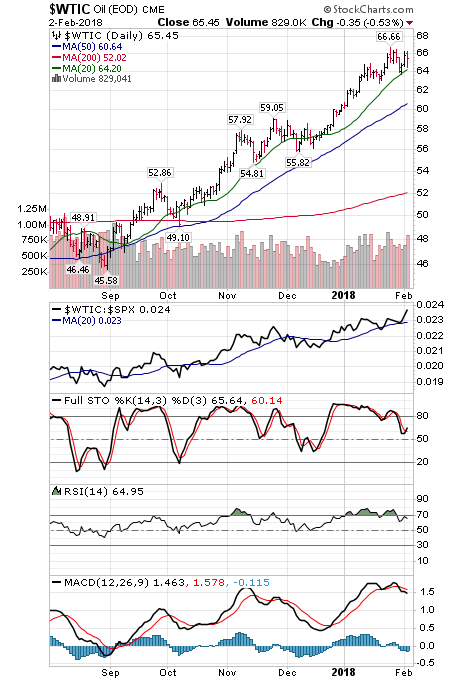 Crude remains above its 20 day moving average. 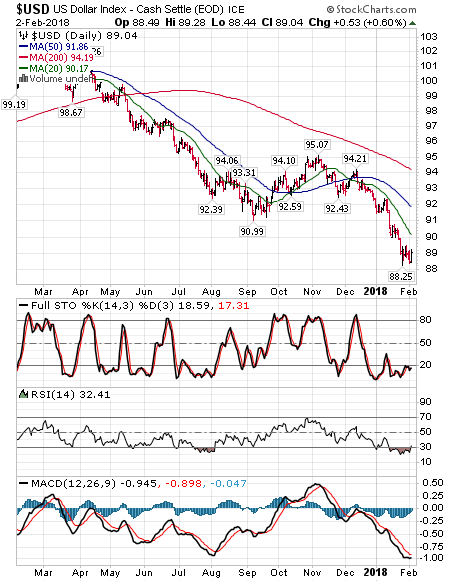 Short term momentum indicators are trending down. Technical score dropped last week to 4 from 6. Natural Gas dropped $0.32 per MBtu (10.09%) last week. Intermediate trend remains up. Strength relative to the S&P 500 Index changed to Negative from Positive. 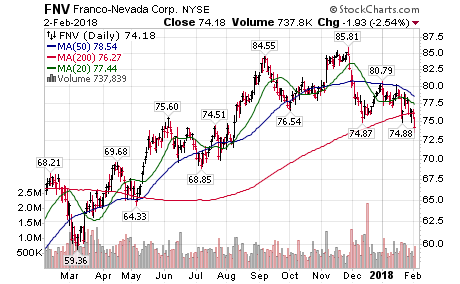 “Natty” moved below its 20 day moving average. 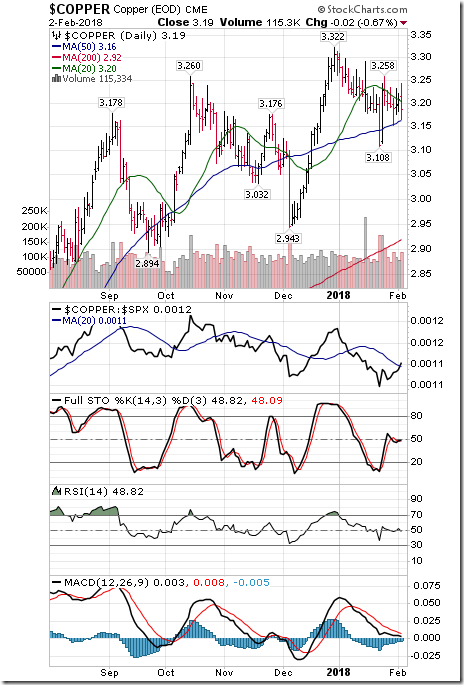 Short term momentum indicators are trending down. Technical score dropped last week to -2 from 4. 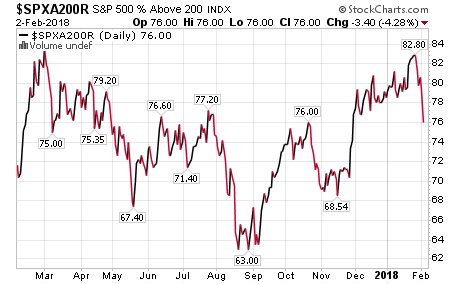 S&P Energy Index dropped 36.81 points (6.42%) last week. Intermediate trend remains up. Strength relative to the S&P 500 Index changed to Negative from Neutral. 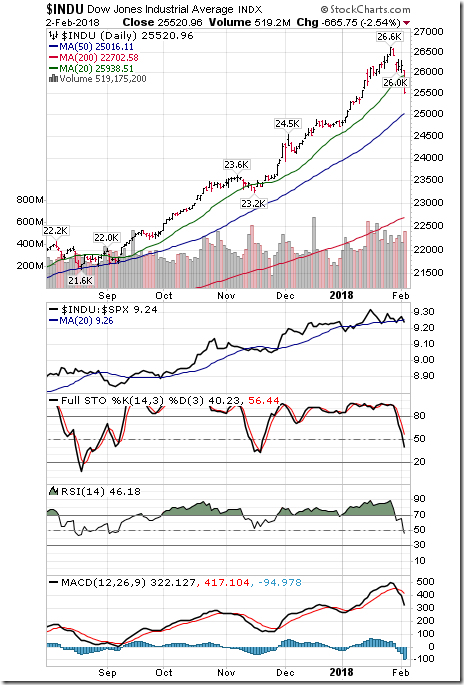 The Index moved last week below its 20 day moving average. 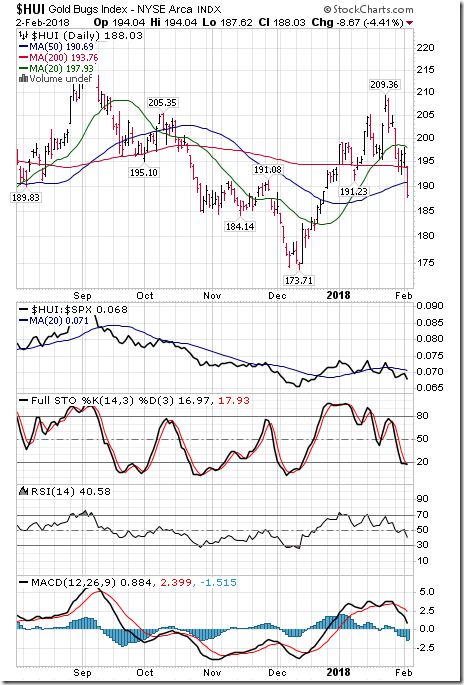 Short term momentum indicators are trending down. Technical score dropped last week to -2 from 2. Philadelphia Oil Services Index dropped 12.15 points (7.46%) last week. Intermediate trend remains up. 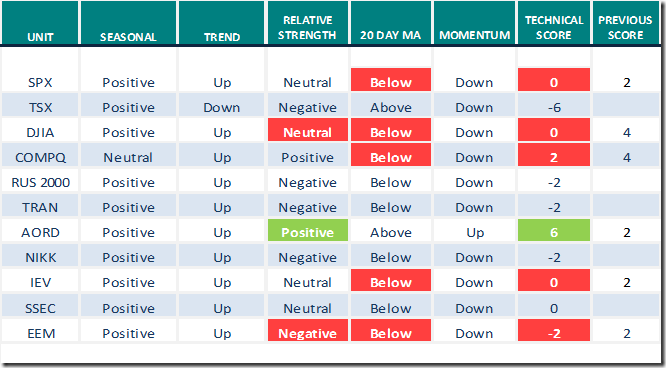 Strength relative to the S&P 500 Index changed to Negative from Neutral. 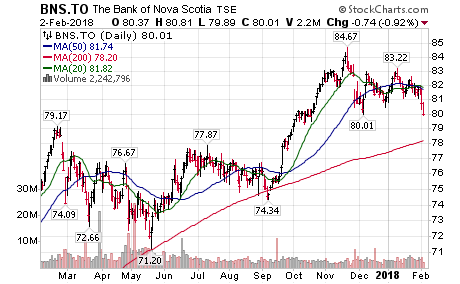 The Index dropped below its 20 day moving average. Short term momentum indicators are trending down. Technical score dropped last week to -2 from 2. Gold slipped $14.80 per ounce (1.09%) last week. Intermediate trend remains up. Strength relative to the S&P 500 Index changed to Positive. 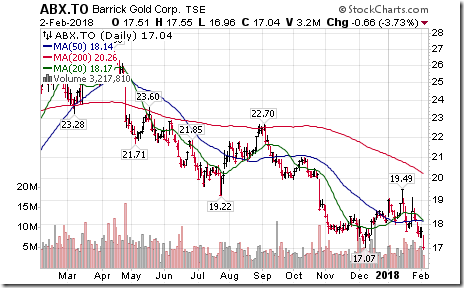 Gold remains above its 20 day moving average. Short term momentum indicators changed to down from up. Technical score remained last week at 4. Silver dropped $0.73 per ounce (4.19%) last week. Intermediate trend remains up. Strength relative to the S&P 500 Index remained Neutral. 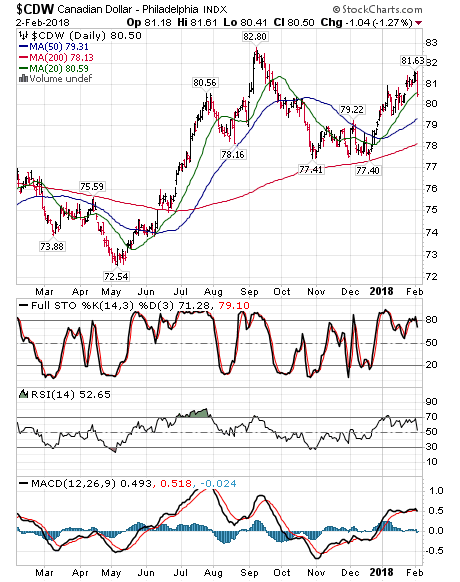 Silver moved below its 20 day moving average. Short term momentum indicators are trending down. Technical score dropped last week to 0 from 4. AMEX Gold Bug Index dropped 15.33 points (7.54%) last week. Intermediate trend remains up. Strength relative to the S&P 500 Index remains Neutral. 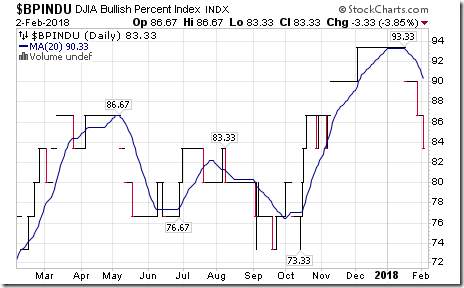 The Index dropped last week below its 20 day moving average. Short term momentum indicators are trending down. Technical score dropped last week to 0 from 4. 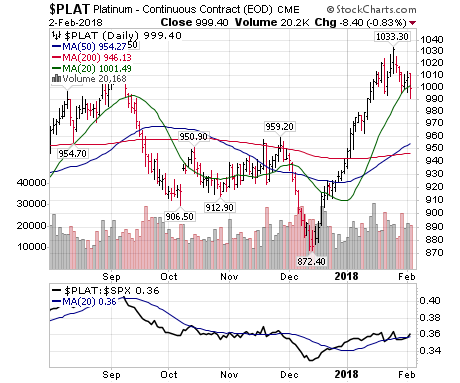 Platinum dropped $19.00 per ounce (1.87%) last week. Trend remained up. 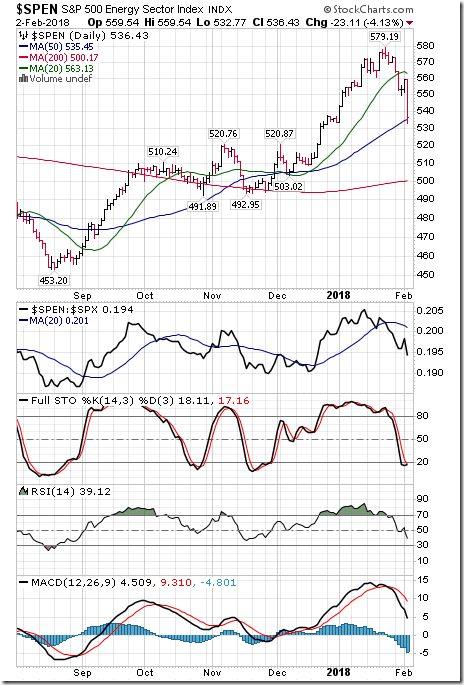 Relative strength remained Positive. 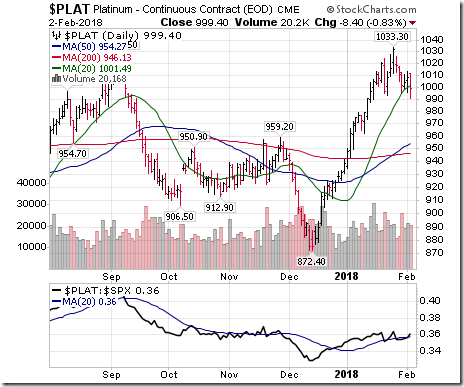 PLAT moved below its 20 day MA. Momentum: Down. 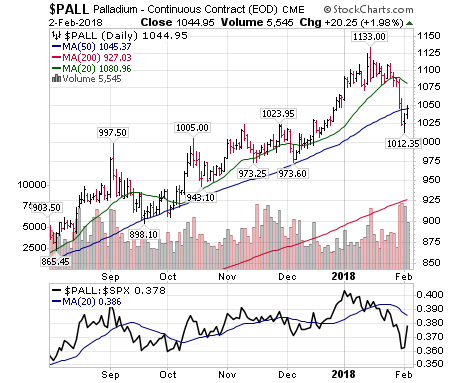 Palladium dropped $40.10 per ounce (3.70%) last week. Trend remains up. 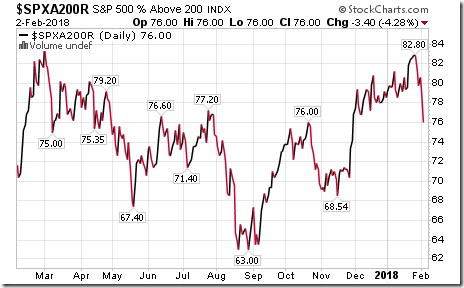 Relative strength: Negative. Remained below its 20 day MA. Momentum remained down. Copper slipped $0.01 per lb (0.31%) last week. Intermediate trend remains up. Strength relative to the S&P 500 Index changed to Neutral from Negative. 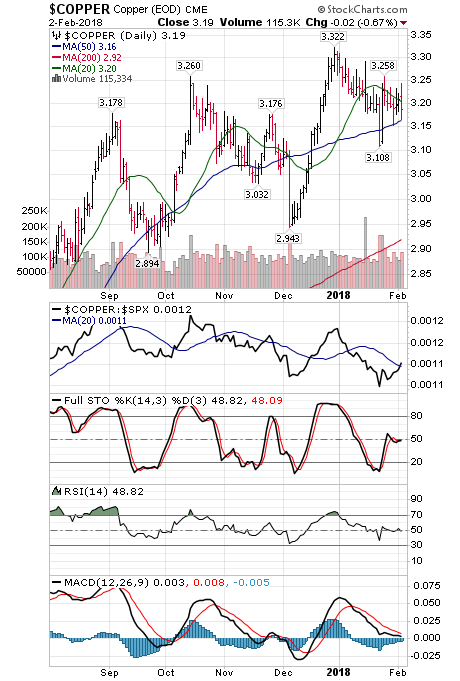 Copper remained below its 20 day moving average. 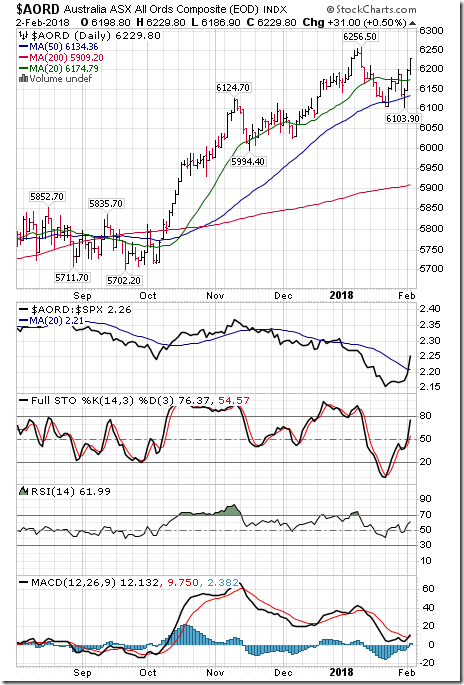 Short term momentum indicators are trending up. Technical score increased last week to 2 from 0. 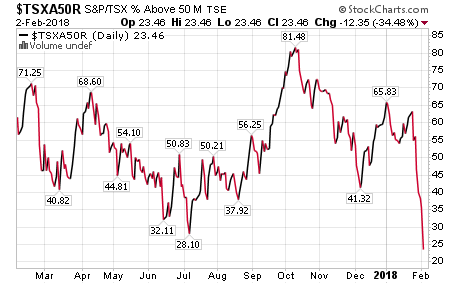 BMO Base Metals ETF plunged$1.06 (8.90%) last week. Intermediate trend remains up. Strength relative to the S&P 500 Index remained Negative. 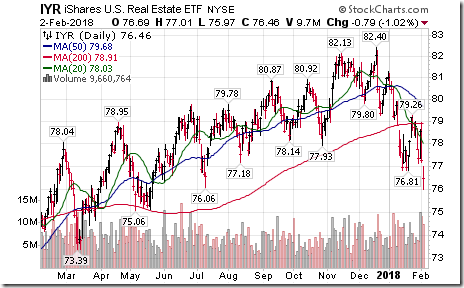 Units dropped last week moved below its 20 day moving average. Short term momentum indicators are trending down. Technical score dropped last week to -2 from 0. 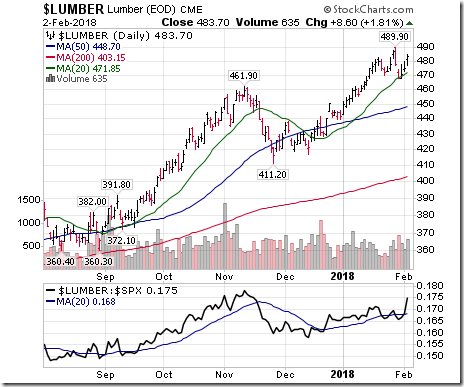 Lumber dropped 3.60 (0.74%) last week. Trend remains up. 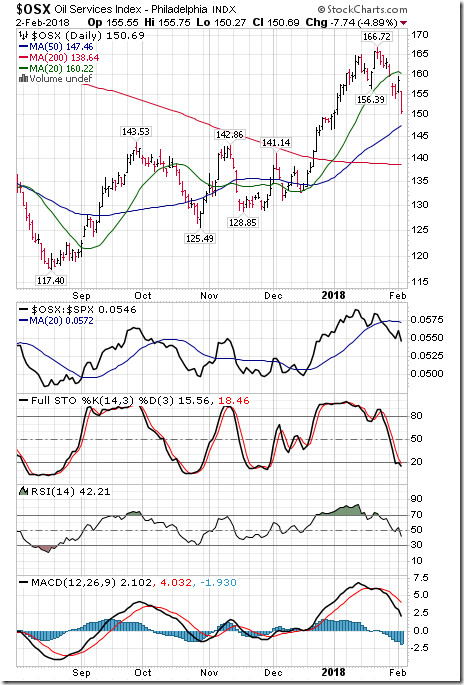 Relative strength remains Positive. 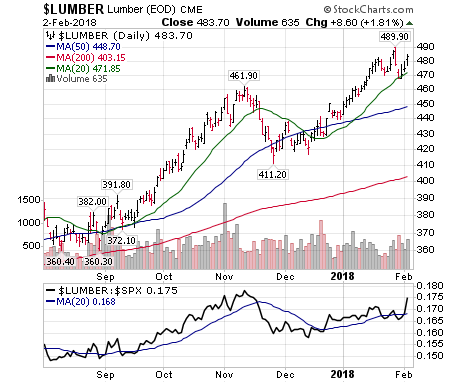 Lumber remains above its 20 day MA. Momentum turned down. Score slipped to 4 from 2. 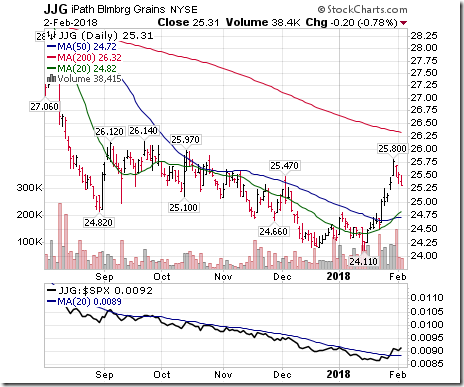 Grain ETN added $0.19 (0.76%) last week. Trend changed to up from neutral. 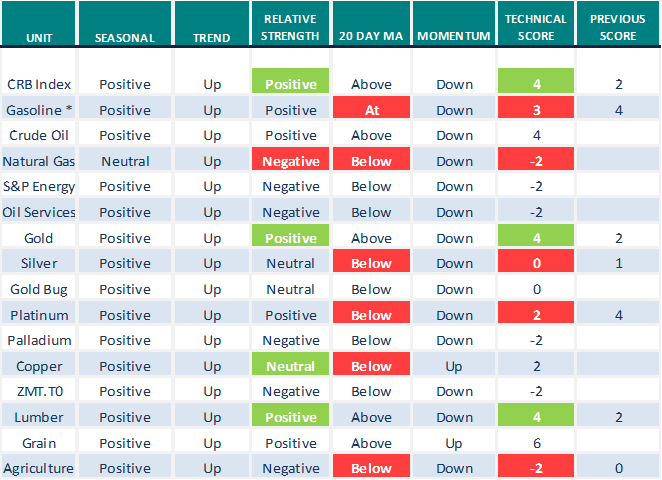 Relative strength changed to Positive from Neutral. 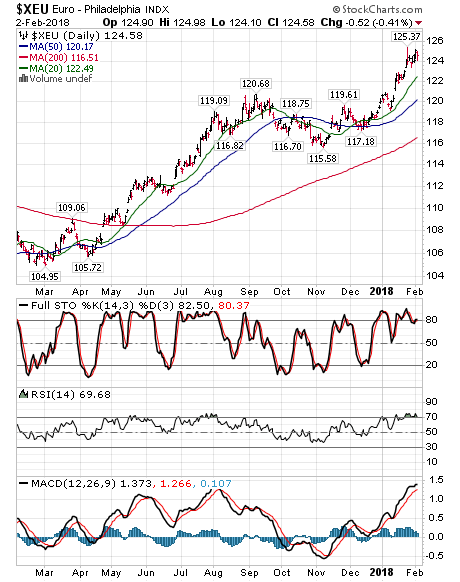 Units remain above their 20 day MA. Momentum: up. 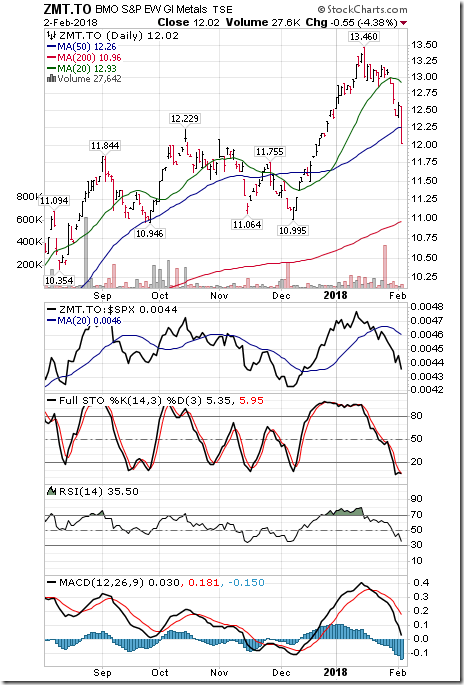 Agriculture ETF dropped 2.85 points (4.33%) last week. Intermediate trend remains up. Strength relative to the S&P 500 Index changed to Negative from Neutral. Units dropped below their 20 day moving average. Short term momentum indicators are trending down. Technical score dropped last week to -2 from 4. 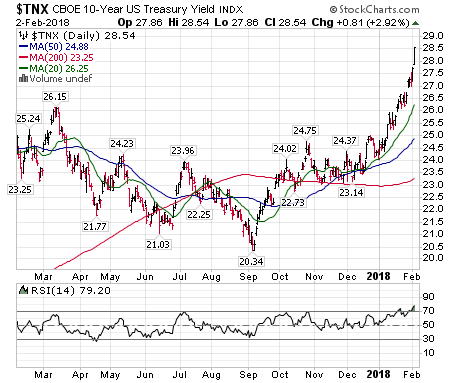 Yield on 10 year Treasuries gained 19.2 basis points (7.21%) last week. Intermediate trend remains up. 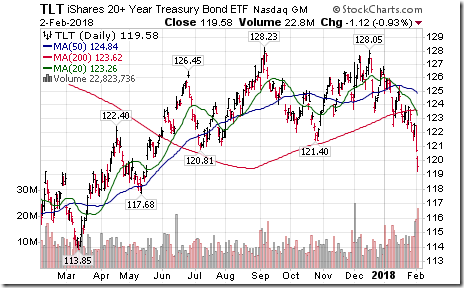 Yield remains above its 20 day moving average. Short term momentum indicators are trending up. 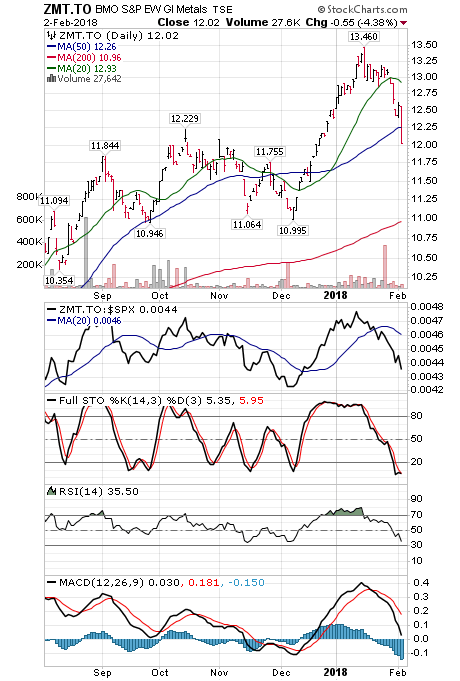 Price of long term Treasury ETF dropped $4.01 (3.24%) last week. 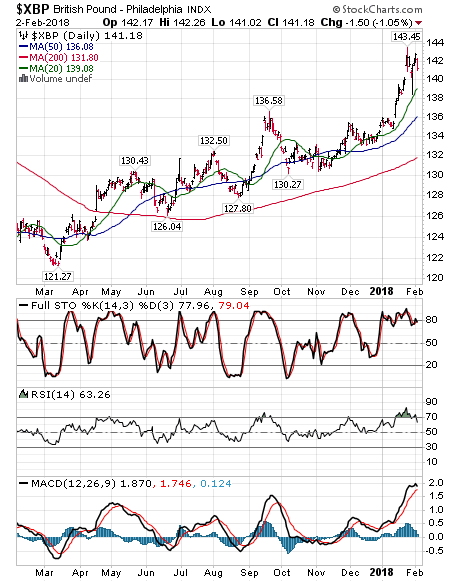 Units completed a Head & Shoulder/ Double Top pattern last week on a move below $121.40. 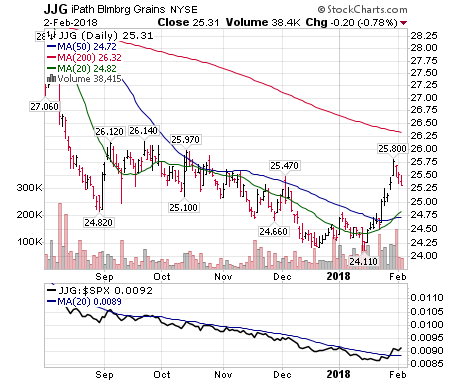 Units remain below their 20 day moving average. The VIX Index jumped 6.04 (54.41%) last week. 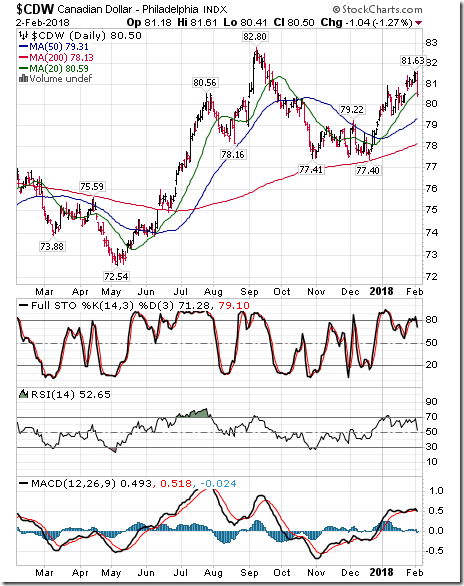 Intermediate trend changed to up on Friday on a move above 17.28. Editor’s Note: After 10:00 AM EST, breakdowns included CERN, HRB, CPB, PG, LEN, MHK, CBS, CVX, DUK and UPS. No breakouts. 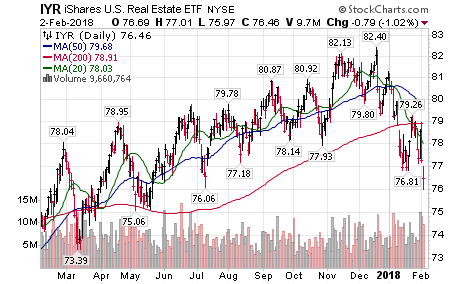 Interest sensitive REIT iShares $IYR moved below $76.81 extending an intermediate downtrend. 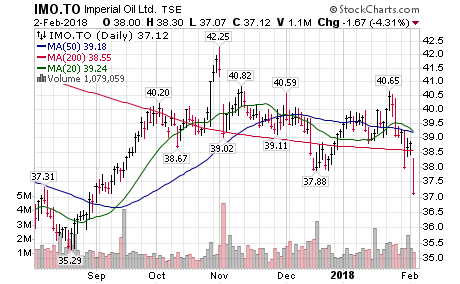 Imperial Oil $IMO.CA, a TSX 60 stock moved below $37.88 extending an intermediate downtrend. 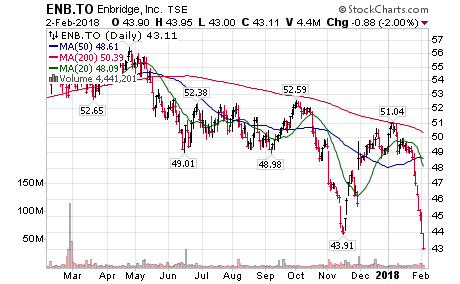 Enbridge $ENB.CA, a TSX 60 stock moved below $43.91 extending an intermediate downtrend. Cdn. 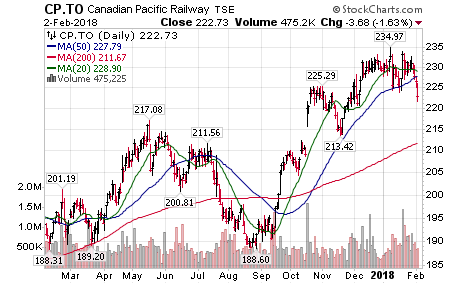 Pacific $CP.CA, a TSX 60 stock moved below $224.23 completing a double top pattern. 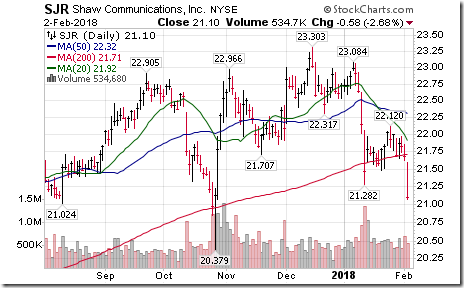 Shaw Communications $SJR, a TSX 60 stock moved below $21.82 extending an intermediate downtrend. 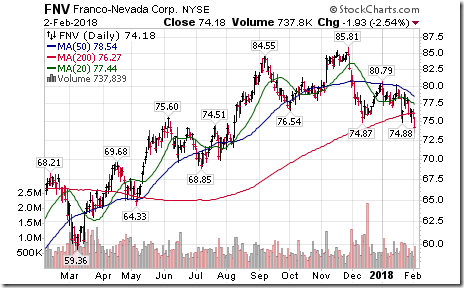 Franco-Nevada $FNV, a TSX 60 stock moved below $74.87 completing a Head & Shoulders pattern. 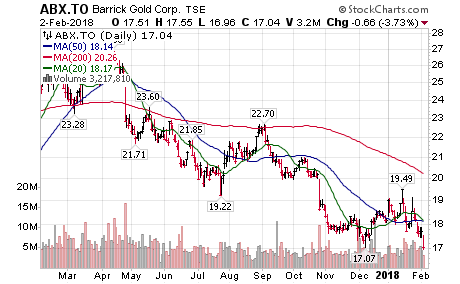 Barrick Gold $ABX.CA, a TSX 60 stock moved below $19.49 extending an intermediate downtrend. 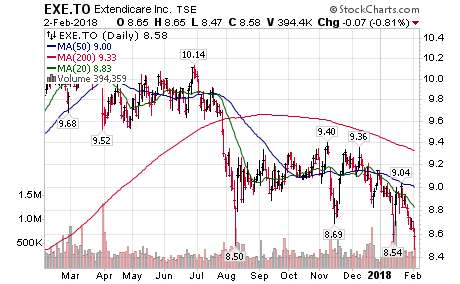 Extendicare $EXE.CA moved below $8.54 and $8.50 extending an intermediate downtrend. Procter & Gamble $PG, a Dow Jones Industrial stock moved below $84.77 completing a Head & Shoulders/Double Top pattern. Bank of Nova Scotia $BNS.CA, a TSX 60 stock moved below $80.01 completing a double top pattern. 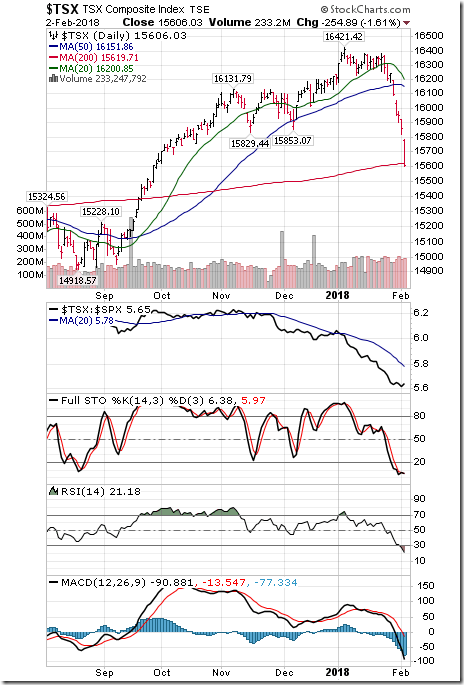 SP500 – Only 47 points away from the 50day. Now is the time to look at what you want to buy and prepare. Whipsaw recoveries can happen before you know it. sp500 at 20 stochastics approaching oversold RSI 42 lowest since Aug 17. The pull back on Friday and this morning were the result of the head and shoulders patter on $SPX $ES. Also, there was an obvious bull flag on hvu.to and uvxy. The pull back today is a result of a smaller head and shoulders on the $SPX $ES. There is a large head and shoulders pattern on hvi.to that will continue to pull the market down, so hvi.to will just rise enough to meet the top of a smaller head and shoulder pattern and then go down again. Usually people do not respond to any posts that I make on a day trade, so just thought I would add this one is case any one is interested. Most people here have turned to dividend investing. Very profitable hvu.to trades, but I know how it feels when people are on the wrong side of the trade, so will not expand on this. Ana,I am not day trading but I appreciate you taking the time to post and sharing your perspective. Thanks. Yes, it is my perspective of where the market is going. I estimate 2605. 97 as a low point from the calculations of the head and shoulders that we have on $SPX and $ES. When that will be, I do not know. Thanks for your post. I trade in the anti-vixes (XIV/HVI) so I’m always interested. Don’t usually have much to say, but I’m always here. 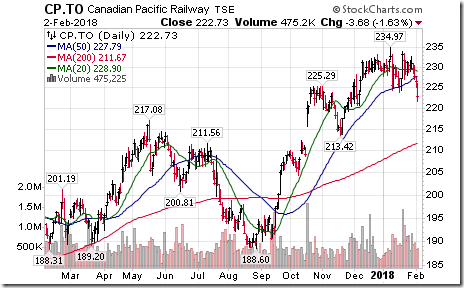 TD.to gapped down on the open this morning and has now dropped below the s2 pivot point support, close to being oversold and a triple bottom. It is not too often the banks have such a nice drop, may or may not drop further tomorrow, will be looking to buy if that does happen. The article linked below won’t be popular with most of our short term market timers but I felt it important to post this one anyway. I for one have been spending far too much time overanalyzing my portfolio of late. The golden years should be a time of R&R, not one of stressing over investments. We have always heard this but XIV, SvXy etc r at a point of closing down after hours. I myself have taken big losses in this but sold them after hour. Need money to stay in the game.they won’t recover this fast. We have to see where the VIX curve stays tomorrow. Always another fish to fry or get back in when and if they survive. They won’t go back to new highs anytime soon in the near future. tnx Ana for your input………your 2606 target is looking pretty doable…….. Nasty Kick In The Backside – Worse than I thought it would be. I just wait it out. So $SPX $ES took a tumble down after the market closed. I trade the normal market on the futures, sounds weird but that is what I do. I am expecting a bounce for tomorrow. However, this will not be a time to buy anything. I think liquidation event might have started now. XIV is already down 82%. Hope they keep it in some form. RIP. This might effect markets too. Don’t buy it AH if someone have access. No end in site. Futures Are Up Quite A Bit – Could be the end of it but you never know. I am a believer that we are in a bull market that will continue for a lot longer after we get through this correction. Economic growth is just too strong and earnings are rising. Bear markets do not happen in times of growth. You are correct the futures are up quite a bit, +14 as I post, however this is only to 2622. The closing low for the futures today after the market closed was 2605. There is something that is very difficult when you are a day trader. That is to realize that you are on the wrong side of the trade and realize that you have to sell. You have to sell either to get into cash or switch to the other side of the trade, to the trend of the market. Unless you do that, you will never be able to day trade. So when the market climbs perhaps keep this in mind. SPX has pulled back to the uptrend. It will be interesting to see if this support will hold. Kam, #13, #17 – I hope you are ok. Thanks for your posts. 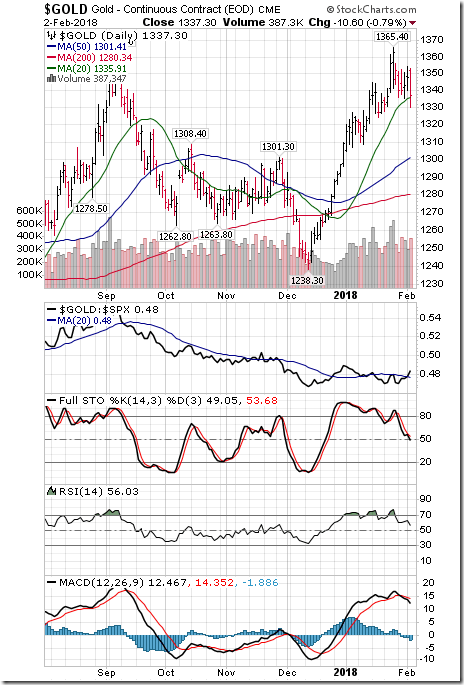 Futures down -40 to 2560.
re #4 – keep on posting pls. Each of us is different, as people, as traders, as investors, what ever. Thanks, Ana. I appreciate hearing about your day trading ideas. I’m just at work most days now so I can’t take advantage anymore! “On the weekend, Socrates came up with a new pattern announcement on the Yearly Level no less. It posted: “Important High Waterfall Likely.” I warned at the WEC that 2018 was a Panic Cycle Year and we are witnessing that forecast live and in person. Today penetrated the January low and we closed below it. We closed below the last two Daily Bearish and in fact we FAILED to close above the What-If Daily Bullish Reversal. We did just slightly crack the 24000 level and this was rather important. Despite all of this, gold crashed last Friday and could not even manage to post any respectful gains given the meltdown in the Dow. The Weekly Bearish lies at 23250 and by Friday we need a closing back above 24745 to imply this week’s low would hold. Keep in mind this is a PANIC CYCLE, and that warns that while it may look dark and grim right now, play it by the numbers for this thing can then swing and turn violently back up after creating a BEAR TRAP. Thank you for the post Sherri! He is not kidding, a waterfall! Thanks for the concern. I am ok but account is not.let say lots of the gains from last year is gone and can still get more about $6-7K loss from HVI holding tomorrow as I couldn’t sell it AH. I think living by the sword can do one sometimes. It is even worse when they wait till after hours to increase volatility and drop these XIV, SVXY etc. We always know it can happen but no one expected this.Wait till tomorrow people have margin calls.That being said,getting long VXX at these levels is also a big risk if Vix futures don’t move much so be aware everyone. That dreaded wave 4 we been looking for since last summer is upon us and target is anywhere from here to 2450 but with the extensions we got to the upside, downside is likely too.That being said, One should look for buying stocks or have a shopping list ready. I would like to add one more caution when reading his comments. 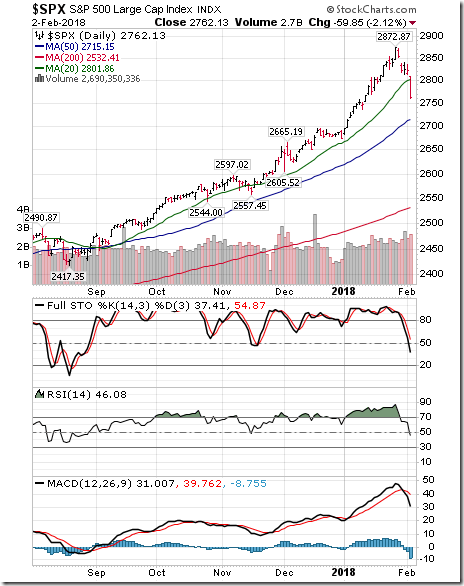 On the post from February 2nd, 2018 that was posted, Armstrong stated, “Monday is a turning point and a Directional Change” so it was natural for people to assume that the market would go up on Monday as Larry/ON suggested in the first three posts. However we were not even at the bottom of the bollingerband, so obviously might go down to that point before finding support. 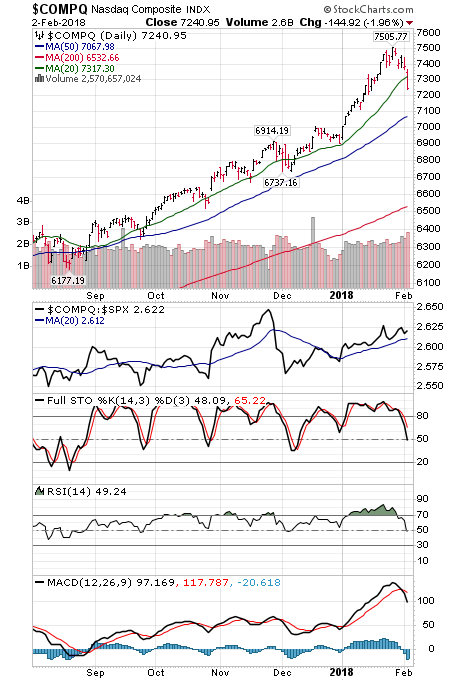 It is dangerous to follow these suggestions, because now Armstrong states, “Our Directional Changes now coming into play for the next two days and then it looks like an opposite move into Friday 9th.” However the market has now found a support at 2530. So I am not sure how far up we will go before turning down again. If someone just jumps into uvxy or hvu.to when tomorrow morning opens, they might find themselves going against the trend for some time. So, maybe just have a look at the charts first before jumping in on the advice of Armstrong on his directional change comments. I thought it would mean down for the next two days but as I was thinking when I was suppose to be sleeping, maybe I read it wrong. Maybe it means up for the next two days and then down into Friday 9th. Notice how he leaves out the simple “up” and “down” just referring to some directional changes. As Neil/Ab very wisely stated, “his evasive yet convenient use of the English language” leaves with without any form of knowledge that I might be able to use. Probably a big company lost “some” money going long bonds . 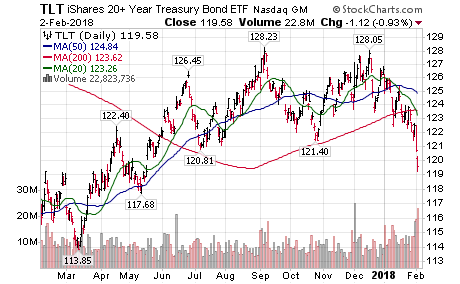 The drop in IEF and TLT is not big in percentage but if “they” use leverage = possible significant loss . So they sell some stocks = a significant drop that trigger some stop losses to other big firms = more sell-off in stocks . Than the “knife will stop falling ” and more investors will jump in . Was able to pick up some TD.to as it dropped below $70 this morning, will see how the day goes whether it will stabilize or not, also added to my wsp.to holdings and looking at aqn.to at the moment. Horizons announced a trading halt on HVI. Wonder if they’ll follow XIV and head towards termination, or just reset since VIX is down to just under 25. Hopefully the later. 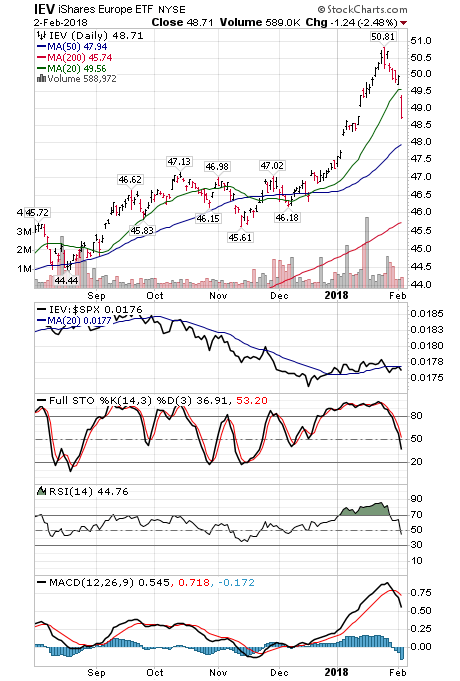 Interesting that last week with the prospect of a correction looming, I went mostly to cash or Mawer Balanced but bought a bit of HVU as insurance. It went parabolic (68% yesterday) and now all the volatility etfs are on trading halts. Think I’ll just sell half to cover my initial costs until the smoke clears. HVU.TO is trading again on TD Webbroker. Thanks Ana, it resumed on my MD platform as well. Just caught up with that. Kam, yes, live by the sword … is a good one – I was going to say the real problem is if using leverage – a two edged sword. I learned this the hard way – merrily selling puts when the market was going up before the 2000 crash. Greed feels so good that you don’t realize when you are getting in over your head/over leveraged. Another analogy: like the frog in water and bringing it to a boil doesn’t know what killed it. Re Armstrong – I see that Neil/Ab, Ana and DC/BC are also saying that he is inscrutable. I wondered when I made my comments, last week, questioning why people were so eager to hear his commentary that no one responded. I thought maybe I was the only one who didn’t get him and everyone else could understand him and make good use of his words. Whenever I tried looking at any of these products, I got sweaty palms – my personal indicator to stay away LOL. 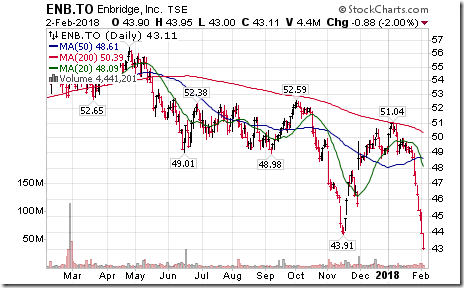 Unbelievable that the low beta stocks like ENB,FTS,EMA etc are getting crushed in this sell off. You would think those would hold up a bit better. Roy, when the margin calls come in, you sell whatever you can…or they sell whatever is in your account. True, but these have been dropping for some time. And no, as much as institutions try to get you into using margin,I learned the hard way some years ago that it was of no benefit to me and would never use it again. Yep, the interest sensitive stocks, notably utilities, telecoms and energy have been hit the hardest. Good move by DH to go to cash and Mawer Balanced Fund last week. The fund holds only 0.44% utilities, 4.10% energy and 5.54% communications. Small wonder its still up YTD. It looks like balanced funds are the way to go. Some may remember me contrasting Ron/BC, and his easily understood posts providing advice, against the somewhat confusing advice often given by the “professionals”. Reading Armstrong’s comments reminded me of why I said that. Armstrong isn’t the only one either. I can think of others, including paid services I subscribed to. It isn’t the type of “hedging” that we expect when talking about investing. I haven’t kept tabs on other balanced funds but I’ve noticed Mawer funds in general have outperformed their peers and respective indexes during the downturn. Smart management team there. The Bid and Ask price are bizarre today. At times the difference in the Bid and Ask price are $4.00, getting as close at $.25. Thank you to all who have responded to my posts. Please keep in mind that this is only my perspective on the market, do not use it for trading. Maybe read what I have to say and then turn to your own charts to observe what your interpretation is. This does not look like a recovery in price, it looks like a bear flag to me. So thinking we are rolling and might double bottom at 2530 before a recovery in price. So Armstrong might be talking about going down today and tomorrow. Only my perspective, look at your own charts please. JP/BC, #49 – I remember and agree. I think we all appreciate Ron/BC’s generous sharing of knowledge/wisdom and his great charts. He probably wouldn’t call it “advice”. 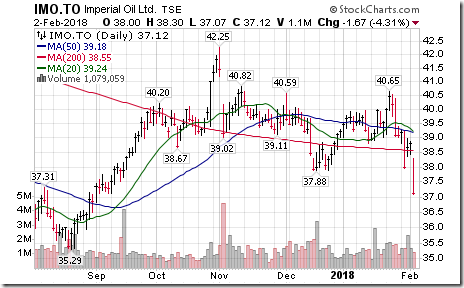 IMO.TO – majority owned by Exxon, so the volume on it is not great but ok. Here is a long term daily chart. Maybe it is a bearish descending triangle or maybe it is a false downside break, which could at least bounce to the descending trend line ~ 40. Keith Richards is talking about a possible bounce on XEG.TO, of which IMO is ~ 4.5%. SU.TO, CNQ.TO, CVE.TO, ECA.TO are all bigger weights. I don’t know what Armstrong did before or what he will do later. But I also don’t seeing any need for people to complain about someone that tells them to turn and after they turn right and fall in a ditch. This was posted on this forum: So EVERY knew what Armstrong was saying. We have elected one Daily Bearish Reversal so far and the next lies at 25941 followed by 25307. A serious correction would only be indicated by a closing for January below the December low of 23921.90. Nevertheless, a closing for January below 25678 will also signal a brief correction is possible. We have turning points coming into play the weeks of 02/12 and 02/26. A low this week can still be followed by a bounce into the week of 02/12 and then down again into 02/26. “Last week’s low in the Dow was 2597465. A closing today beneath that level will confirm the January high and we should see a pull back to retest the critical support. The Weekly Bearish Reversals begin at the 24741 area down to 24696 area. If we can close beneath them quickly, then a sharp correction is likely into early March. The critical decision for the market will come the week of February 19th. At that point we will begin to see the market determine the direction for a move ahead. From the week of March 12th we should then see a trend unfold. As long as the January high stands, then we should see a March low. This correction has the major underlying support on the monthly level which begins back at 22410. So it will be a question of TIME and PRICE. Falling back to that level in early March and holding, may be an excellent entry point. Of course, if we penetrate that level before March, then we are looking at the 21600 area. Can someone help me with this question, please. So I do not have anything in the market now, I am just watching the market at the moment. I was close to my target on Monday so cashed out of hvu.to before the market closed. I always trade hvu.to and hvi.to, just like a few others on this blog. Today was quite confusing. Monday hvu.to closed at 39.99 (Feb. 5th) and opened today at 42.05 (Feb. 6th). Monday hvi.to closed at 13.40 (Feb. 5th) and opened today at 2.49 (Feb. 6th). Of course with Christmas yesterday I took the day off, but I was so confused with these two today, I did not trade. Can someone also help me with this question too, please. When oil was tanking, hou.to ad hod.to just kept splitting. They did not eliminate them. When hvu.to continually goes down, they just keep splitting, so this is still could be traded. Why are they eliminating XIV? If we can get down to 2671 and reverse, the market is off to the races! That will be a completion of an I H & S .
There are also some numbers below, that could be relevant too, but would be a quick reverse off those numbers. I expect you knew what they are as you trade them all the time. If you were not in HVI then consider urself lucky as this was the rarest event.Anyways here is the explanation. XIV, SVXY, HVI, HVU, VXX and most others are reset every day and IF they can lose 80% in one day, issuer has the right to shut it down. You know what happened yesterday. 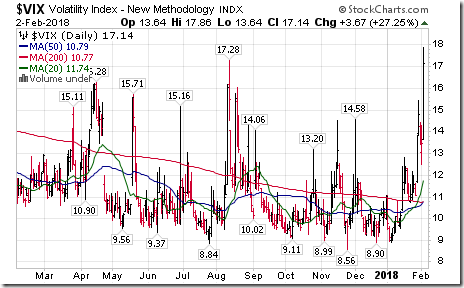 Vix moved up more than 100% but it is not the problem. Problem is the Futures of first and second month VIX which should not go up more than 80% to start liquidation as XIV price depends on it. On Brexit or on that Aug 2015 day, VIX moved up a lot but futures did not go up that much so SVXy, XIV etc survived and made new highs after that. That is why no one thought that event will ever happen and these kept on surviving. I think these guys can also start that even if they want to once drop is more than 20% but they have never done it before. Soon as market close yesterday, someone, most likely these issuers moved the Futures up by buying back the shorts, hence going past the 80% threshold and start liquidation XIV, SVXY, HVI etc. Those guys were in the game and they or their friends might have shorted them a lot once they know they will liquidate these funds. No one knows and they chose to hold the price artificially high on these during RTH so most people can’t even sell these after hours. Scam to the highest degree. Somehow I saw that VXX has moved towards 40-50% gain past 1 PM, I immediately know what is going on and got out right away out of SVXY just north of $60.If I were not aware or busy, I might be looking at much bigger losses. XIV was artificially trading away from NAV for last 10 days or so and with much less volume so I moved to SVXY. That is one reason SVXY survived as it didn’t fell the required %. It is here and we can still trade it but have to always keep in mind what can happen to it in future. XIV dropped more than 80% and those MF’s kept it at $99 close of market and then dropped it towards $50 straight giving people no time to get out. Lots of stories will come out. We were playing with fire and it did catch onto us. Need to have some kind of protection in the future to trade them unless they are banned for good. Now HOU HOD etc are for oil. I don’t know what the prospectus says for them but oil never falls or goes up 80% to stop them from trading. same for VXX HVU etc. Volatility will and never drop 80% in one day to stop them from trading. It is the one-day event which did them. If you guys remember I have been posting that as VIX is too low so a move from even 10 to 20 can trash these products as it is 100% move. Going from 30-40 is same points but not 100%. This thing is a like a rare chance of lightning strike which have not happened before since inception of XIV but yesterday it did. People forget that, me too. If I trade them which I will as old habits die hard, I will always be protecting my capital with a put on SVXY from now on. There are rumors that FED was long XIV and they sold it all before it went off NAV and it is off balance since then, These guys become too big and were affecting the VIX futures and FED rather have one instrument die than affecting the full market. Make sense than to create more panic in all the market. Who knows. Thanks for sharing the article. Excellent read. Thank you for your comments. My biggest question is that the calculation for hvu.to is incorrect, considering the calculation for hvi.to. “Today was quite confusing. Monday hvu.to closed at 39.99 (Feb. 5th) and opened today at 42.05 (Feb. 6th). XIV was showing shaky legs since Jan 16th. 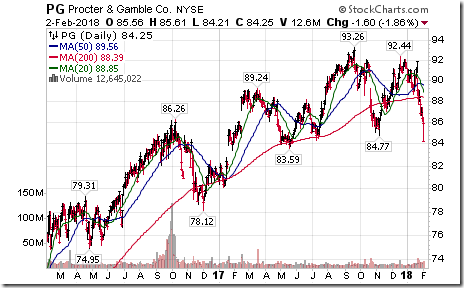 If people make trades on it based on charts, this chart “could” have been a warning sign – look at all the red ohlc bars, look at the TSI. But as always, hindsight is 20/20. It has pulle back before & a few days later gone to new highs. In a way I am in the short vol boat as well, by buying VXX puts on jan 16th, and adding on jan 18th, knowing that the spikes last for just a few days. Again – hindsight – the perfect guide! Yes, on February 5th, $VIX futures contango settled at -15.80%, so hvu.to was in backwardation. So there was a strong wind behind hvu.to that is why I question that it only rose by a small amount whereas hvi.to dropped by a large amount. I think that calculation is off for hvu.to when it opened on Tuesday. I had no position at that time, but something is off. HVU and HVI although opposite to each other, they still have their own limits. HVU did not trade afterhours otherwise it might have been much higher but when the market opened yesterday it was just little higher. HVI’s assets where liquidated after hours so it did fell 70-80% or whatever. Those guys running HVI did not wait till next day as they might been looking at millions of $$ losses if they wait. However people buying selling HVI have to follow the rules of stock market and wait till next day and got whatever left off it. Its more like one owes someone rent of the place and owner come in when you are gone and take your stuff away and sold at whatever price to collect his money and when you arrive next day at 630am and opened the door, there is just one crappy sofa and some beer left in the fridge to console,:) Everything else is sold for pennies to make up the rent and you can’t do anything and this is in the contract and fully legal. Hope it make some sense. What happened is that with Liquidity gone, there were not much bids or offers to buy sell VIX futures. XIV, HVI etc are short 1St and 2nd month futures and when market closed and there were no liquidity in VIX futures, Mr market knows that these guys have to cover future short at whatever price they are offered to protect themselves. So nothing was offered and XIV issuers were buying futures at any price to cover short which increased price of futures big time and hence past 80% threshold, a snow ball effect. Kam: re post 63: Thanks for the insight. It all seems rather dodgy. Just when you are primed to make some money they change the rules. Numbers are deceiving. HVU went up 75% in one day and would have gone up more than 130-40% if allowed to trade after hours. HVI dropped 80-90% from $18.76 to $2.49. that is what the math says. Nothing wrong with that. I guess HVI, SVXY issuer decided that they did not fell 80% or shutdown limit so were kept alive and now trading down close to 80% off. Only diff is that VXX, HVU etc kept on trading but once XIV dropped 80-90% , their issuer decided to close shop and most assets were liquidated and shut down. Hi all! Writing from beautiful sunny Puerto Plata. Excellent WIFI connection in resort everywhere. So been checking in time to time. Glad not at home watching ups and downs- so much volatility! Will be home on Thursday night. Have lot of cash to invest. 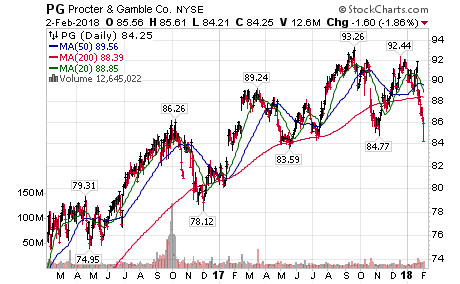 Am watching dividend paying large caps. Ana and everyone else thanks for your comments. Some may not write but am sure appreciate them. I could use a break to Mexico but I couldn’t afford it right now, lol. Have fun and enjoy. Hvu.to does not trade after hours, but it is based on Vix Futures and they are active after hours. Hvu.to is not updated after hours, but Uvxy is updated after hours so I keep my eye on that. Something happened after hours that was not above board. I am really hesitant trading now, watching with anticipation to sell at any moment. I wonder what this will do for the confidence of the individual trader. I have a friend whose husband is a high roller broker, making over a million dollars a year (I surmise this from their life style). Their son works with the father and commented about how happy he was that “some stock” as my friend put it, went under. The son mentioned that maybe more people will use brokers now. Ha! Enjoy your vacation! Would love to be somewhere near the ocean! Not sure that the market will be steady enough for a long term investment this month! 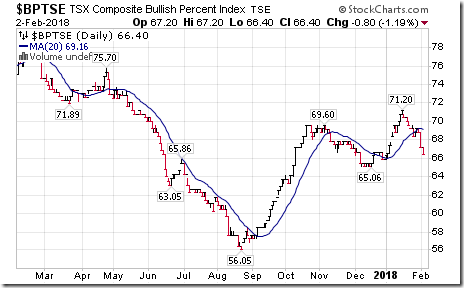 Would highly appreciate having you throw up a chart of your latest thoughts/analysis on BCE-TO and BCE-N please. Is anyone else looking at adding or buying in at this point ? They say the best time to buy a dividend stock is on the announcement of a dividend increase. BCE announced a 5.2% increase today. 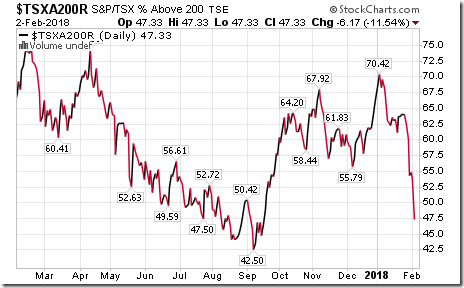 Just had to take a look at the market last night and this morning.Here is the $TSX that has been under performing most other markets over the last year plus. The major breakout point that should have served as price support was the 2014 high at 15524 that price broke out over and then pulled back from and finally cleared and held above this major resistance point after rallying 900 points. Price has pulled back to this point and broken down once again and tested the 2017 lows of 14900. Price is now trapped between 14900 and 15700. A break of either channel top or bottom will determine the next direction. Meanwhile “chop chop” and it’s whipsaw time. Keep in mind most significant corrections last several weeks at least if not several months. The last correction of significance started in April 2015 and ended in January 2016. And that wasn’t even considered a major correction. Lower trend indicators show the 20ema below the 50ema and bearish and the 50ema heading down. Not a good sign. There have been many bearish signs of trouble for weeks now. And many markets are very overbought and stretched out to extremes and very over valued according to those that monitor value. Despite some very oversold ‘short term’ oscillators and tests of price support this correction could be far from over. This is a mid term election year in the U.S. and doesn’t have a good track record for investments from what I’ve come across.”Buyer Beware.” Meanwhile back at the ranch, I’m going to enjoy the sunshine………. 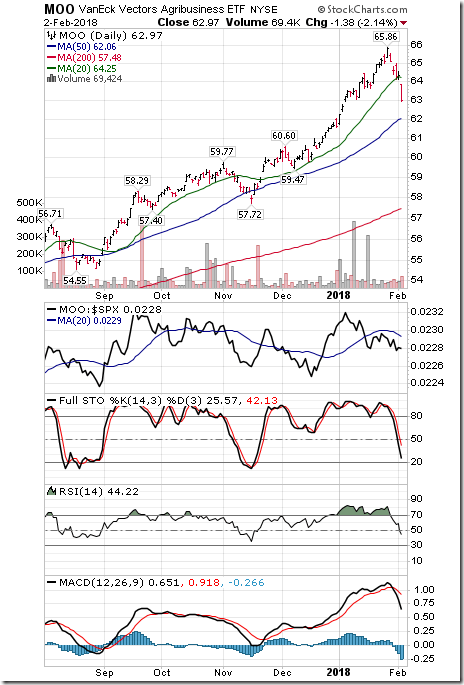 KC #91 – happy to put in my 2 cents on stocks that I follow. Hope that we don’t run out of posting room on this board before Don V. returns. At another time, there seemed to be a limit of 100 posts. Congrats on your COV.V. It’s been soaring while the market was plunging. I chased it for a while, but ready to surrender. 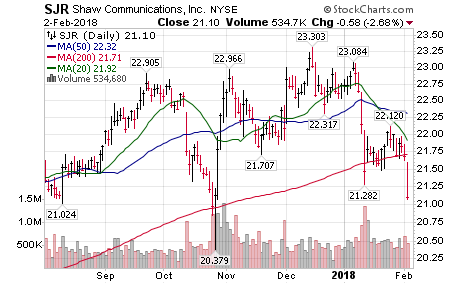 To Ana, I need some advice on dealing with platform breakdown issue, I was trading hvu.to this morning, day trading, in and out with minor < 1% gain or losses, all of a sudden the RBC platform breaks down and would not accept any orders. I called them immediately and web messaged them, however, it wasnt until 20~30 min later did I get through and by that time, I put in order through and suffered a 10% loss. In scenario like this how could I best recover any loss if thats at all possible? I was the one who gave you the link to that live feed. Thank you for that information, I use that exact link. What position are you stuck with? Were you trading your entire account? You can work your way back from a 10% loss. I was just trading hvu all this morning and being very nimble, i was trading about 80% of my account…even now the web site for RBC platform is not accepting trades. I bot at 40.22, thought to get out at 40, but ended up getting out at 36, of course now its back to 40….howeve, i am just wondering if you have any experience like this ever, reason i come to you is because you mentioned you day trade, today i happen to be off, so i thought i have time to watch the screen and give it a try, but never did i thought this might happen? I guess my question is would platform providers ever compensate anything to traders if something like this happens? I spoke to a resolution officer and explained the situation and he said he will look into it and call me back. I know you’re busy with work but could you please put up Armstrong’s latest? “The Back-to-back Directional Changed on the Daily level have played their role. They produced the first low and then the reactionary high. We closed weak below 25490 yesterday so we now see the result. The close today below 24000 warns that we are still headed lower. The low is by no means in place just yet. We still see the risk of moving lower into the week of the 19th if not the first week of March. 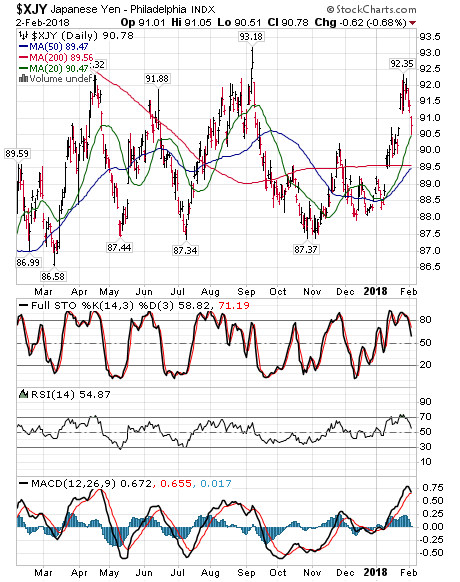 The dollar is still pressing higher and that is not the real issue. The Euro will be under some question going into the Italian elections the first week of March. 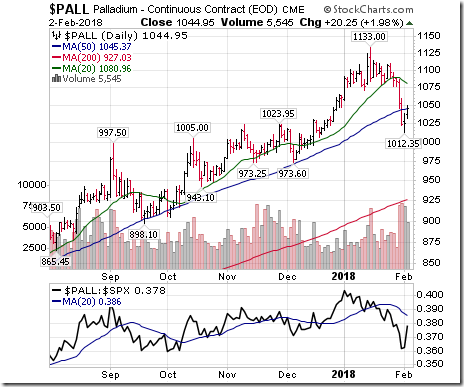 Silver is falling and gold is also failing to respond as so many expected – stocks crash gold up. As I have warned, gold is not yet ready for prime time. Tomorrow, a mere week-end closing below 24695 will be a confirmation of lower prices ahead. However, the close today below 23920 technically warns that we may test the third Weekly Bearish Reversal down at 23250. Electing that tomorrow and there is a risk that this Panic Cycle Year will indeed break last year’s low of 19,677.94 before this is over and we can do this all by March. Keep in mind that 1987 + 31 Years = 2018. The closing today below the top of the Weekly Channel, 24,437.39, has significantly warned that we are going to see lower prices. If we penetrate the bottom of that channel, 22,439.76, then there is a very good change that we will break the 2017 low even by March. Even if you don’t understand his methodology, I’m sure everyone gets his gist. Ignore at your peril! The Head and Shoulder target was 2579 and so I cashed out. Will see what tomorrow brings. I had a peak at my hvu.to and hvi.to daily charts. It looks like hvi.to can not go lower right now, usually one of these is a definite indicator of the direction. I was trading on the one minute chart today. Thank you to Wayne who introduced the live feed charts many years ago and also taught me how to set the indicators. Do not expect to get anything more than free trades or a “good will” small donation to your account. Do not worry about it. You will be able to get back your losses. Just focus on getting more accurate with your trading indicators. What indicators are you using for your trading? I am not familiar with the RBC platform. What indicators do you have on that platform to follow price? Thank you for the articles. Are you trading these days? I often think of your bravery of establishing a new home. You would really know how smart you were if you were in our cold and snow this winter. There is a small I H & S that maybe will take us to 2636, then we can take another look for direction. Sherri, reading your posts with interest. Yikes, what a week !! So market shooting up rapidly. I ended up picking up some BCE.TO at the close. Fingers crossed it does not get caught in this market correction. Curious to know whether you tend to hold onto it for dividends or get out before ex-div ? Not too happy to come back to this! Been snowing non stop- Oh well… all good things come to an end. Any idea when the sellers will run out? 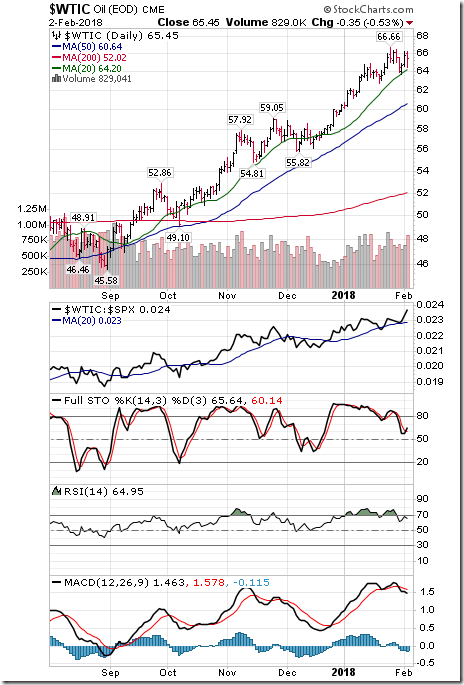 Base metals and oil still falling. Is it time to nibble? Hope all are doing well in this miserable market and weather. Don’t know if this will work or if it will be of use to anyone ….sorry couldn’t send chart. We are short about 150/200 points from our ideal target but this looks like it might be done. More often than not wave 3 is the longest so 5 should be shorter. There is a wedge-like structure as a 5th of 5. In short we would be looking for a good bounce about here. This is a total drop of 3200 points. The slingshot refers to a violent countertrend to the current downtrend. It calls for a parabolic “V” bottom. Also in this case predicts a new high and once we make that it could be the end of this current bull market. With a more moderate counter rally we could see the bull market continuing for a few more years. FWIW I covered my shorts this morning. We could have a few more days of chop, but I think this down move is petering out. 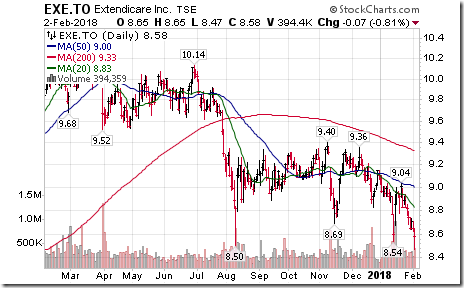 I have noticed a great deal of insider buying in Sylogix (SYZ.TO) It used to be a 5i favourite. Anyone know what their current take is on this company? Oh no! What bad comments I made about the market! I have the flu so did not trade today. Slept all morning. Will try not to comment, sorry. At least we are back where we started on hvi.to. Try to send that chart again, would love to see it. 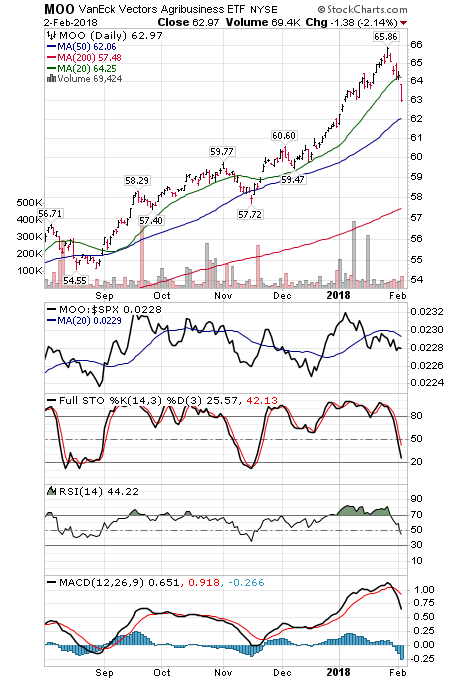 Don’t know about 5i but KeyStone Financial recommended it at the World Outlook Conference. 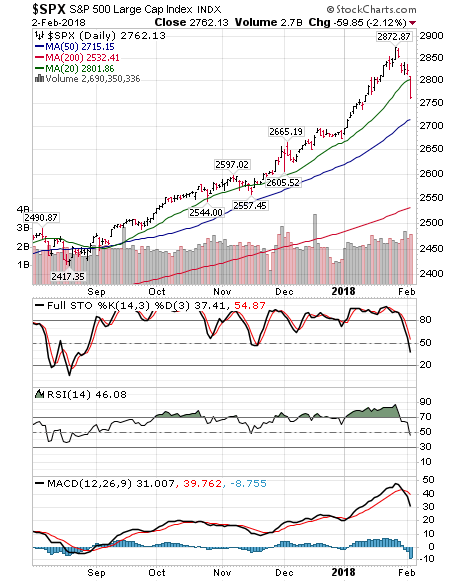 up to new levels, looking at 35,000 to 40,000 by 2020 to start in the DOW, once it can get through the 28,000 level and it could be higher before it all falls apart. He is forecasting THAT as well……. Thank you, Mary. I had followed this site a long time ago, but lost it. Always good to see more analysis for trading! Sherry, thank you for your reply on Sylogics. yea thats what I figured, I usually just have stockcharts open and the usual moving avgs, macd, rsi, and trying to decipher the chart pattern as i move along, only a beginner at best. I have a regular job and cant look at the screens too often and rely on stops for safety, but the past 2 to 3 years has not been doing well, despite everyone around me that I know is making money. Trading has been fun, exciting, but I think I am just a bit too emotional at times to trade objectively and rationally. I may just have to rely on professional financial advisor from now on, hoping friends have good referrals. Happy trading! Do not be so hard on yourself, it is almost impossible to trade when you have a full time job. Money sitting in a tfsa gathering interest is good too until the market starts up again. When the market is moving so fast in a downward motion it is difficult to trade back and forth in a double leveraged etf or etn. I would not suggest that for someone who is a beginner at trading. Are you stuck in a position?